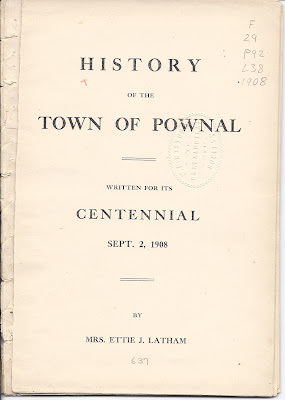 History of the Town of Pownal, Written for its Centennial, September 2, 1908, by Mrs. Ettie J. Latham. Withdrawn by the New England Historic Genealogical Society. It may have been scanned previously, as the text was mostly unbound and was separated from its hard covers. 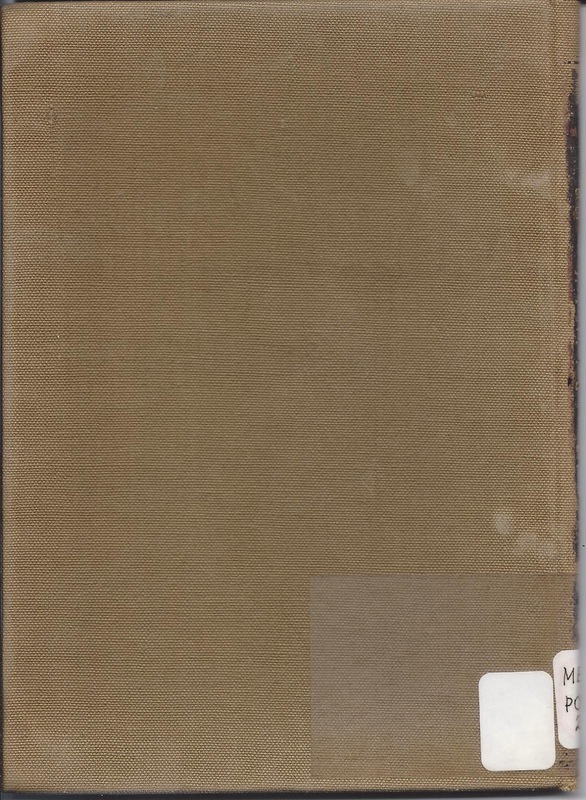 This book of 40 pages was obviously a labor of love, written through the prism of 1908. The author ended her history with a call to youth to cherish their heritage and maintain the grave sites of the founding settlers of the town. I wonder if a bicentennial update was prepared in 2008. If so, in addition to an account of the 100 intervening years, I'd like to learn more about the history of Native Americans in the area and more about the challenges and contributions of the early women settlers. It appears that the book was originally purchased on October 2, 1917, with funds from the bequest of John Harvey Treat, A.M.
One hundred years. One hundred years of hopes and fears. One hundred years of joys and tears. Five times within this hundred years has history repeated itself. Five generations have completed their life work and passed to the great beyond. As many more have taken their places, and still the long procession is slowly moving on. The pendulum of time that has swung untiringly and unceasingly for so long a period of years is now ticking away your life and mine. In childhood, when our lives are young and our hearts are strong, the hours pass all too slow, and we would fain move ahead the hands of the clock were it in our power; but in after years as our life has passed its meridian and we are moving down the western slope, so quickly do the years slip away, that before we are aware, the shadows of late afternoon are falling far across our pathway. No more fitting place for this review of the past could be found than the audience room of this dear old church. It is large, it is lofty, it contains many feet of space, but there is not one inch in it all, but what to-day is overflowing with memories, collective and individual. Those which we hold in common are more on the surface, but the individual memories are the most precious possessions of our lives, and they will be ours so long as life itself shall last. but the curls were gone. I fancied the mother looked sorry. I, too, felt a personal loss. To-day the curly-headed boy is an aging man with close cropped hair of gray. He always loved the home of his birth, and he honors our gathering to-day by his presence. Another pictures comes to me from the past. Four little maidens on the Sabbath are seldom absent from the family pew which they occupy with grandfather, grandmother, father and mother. The brother oft-times comes, too. To-day one of these little maidens is a matron grown, and the mother in one of our pleasantest Pownal homes. We pass on to the next. So vividly comes the remembrance to me, of a woman past middle-age, seated at the head of one of the wall pews. Sabbath after Sabbath finds her there, - in fact she is never absent save from extreme necessity. Her devout attitude during the service is expressive of the Christian character which is evident in every line of her face. She has experienced many changes. The husband of her youth has passed away. She has bade child and after child good-bye, some to never return, but her faith never falters, - to her, all this means a closer walk with her God. Unfaltering to the end she bore her burden. To-day the children and the grandchildren of this noble woman have opened the old home, and we do not doubt but at the twilight hour "the forms of the departed will enter at the open door." Last of the four is this. 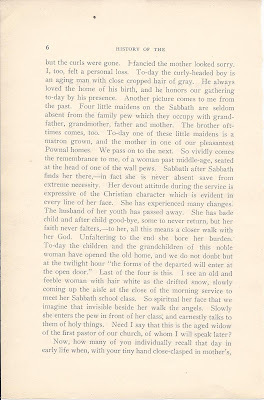 I see an old and feeble woman with hair white as the drifted snow, slowly coming up the aisle at the close of the morning service to meet her Sabbath school class. So spiritual her face that we imagine that invisible beside her walk the angels. Slowly she enters the pew in front of her class, and earnestly talks to them of holy things. Need I say that this is the aged widow of the first pastor of our church, of whom I will speak later? "I love thee, I love thee, pass under the rod." 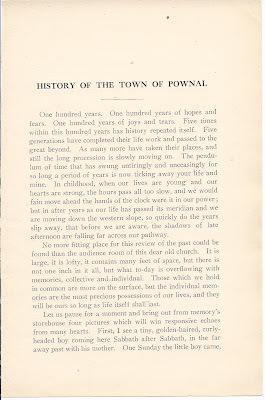 All these and hundreds of other recollections of the past, are to-day filling our hearts with tender memories, bringing us into close touch with each other, and for the day at least, Pownal holds her own again and we are no longer strangers but members of one family. We will now for a while turn from that which is personal and consider the early history of our town. made their homes, belongs to the age known as Drift, while the lower lands belong to the Champlain period. 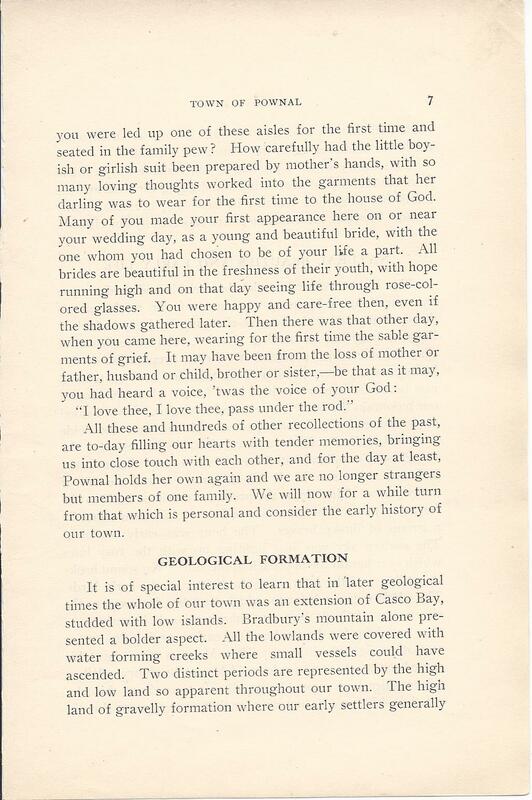 The theory which I present to you is made fully evident from the fact that in excavating and digging for wells, marine fossils like those now existing in Casco Bay are occasionally found. Three of these instances are reported by our citizens. making their early homes here. Authentic history tells us that in 1755, only ten or twelve log huts with a small meeting-house and block house comprised the settlement of New Gloucester. All the crops that this colony could raise, were obtained by the men's working under the protection of swivel guns that could at once be brought to bear upon the enemy. In the year just mentioned, an attack was made, and one of their maidens was carried away captive. Still later, in 1757, a similar occurrence took place in Freeport, and not only was a young woman taken captive, but several were killed by the Indians. Then also the rough and forbidding formation of our town, before the draining of the swamps, or the grading of the high hills, must have been an unsatisfactory location for ___ [the word appears to have been erased]. These two conditions combined furnish sufficient reason for settlers to be slow in coming. Owing to the loss some years ago of our first book of records, considerable difficulty was experienced in placing the early records of our town. 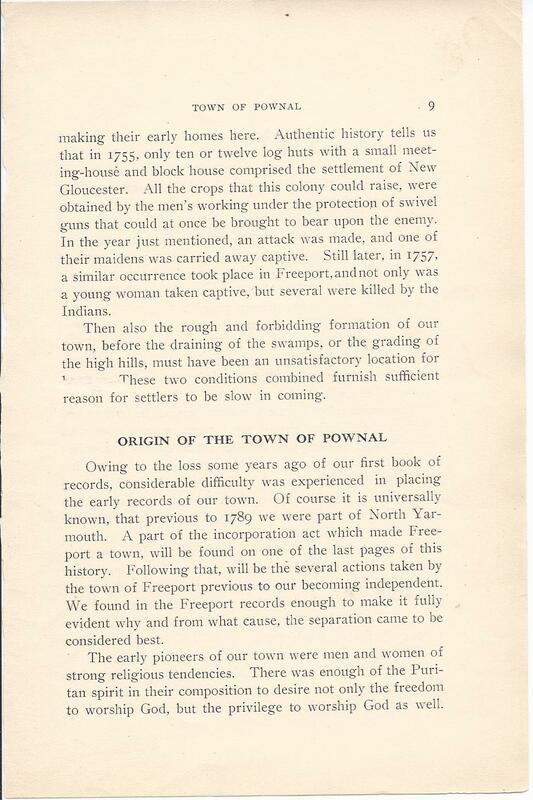 Of course it is universally known, that previous to 1789 we were part of North Yarmouth. 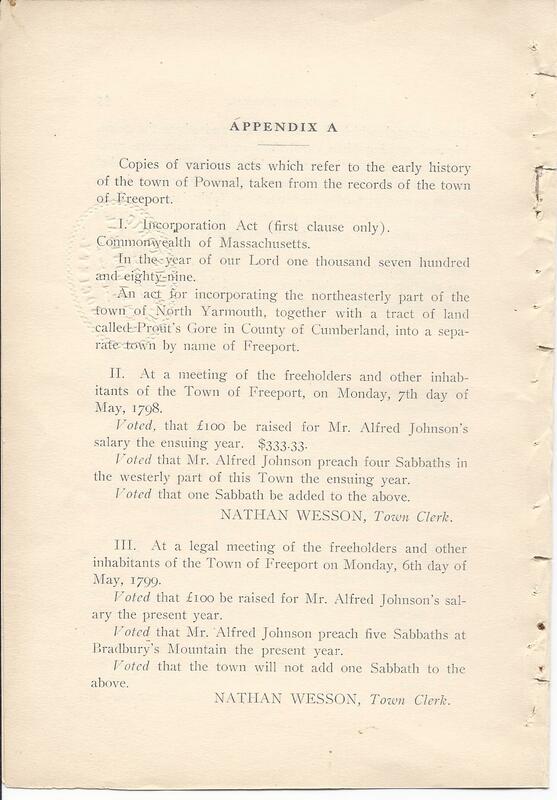 A part of the incorporation act which made Freeport a town, will be found on one of the last pages of this history. Following that, will be the several actions taken by the town of Freeport previous to our becoming independent. We found in the Freeport records enough to make it fully evident why and from what cause, the separation came to be considered best. The early pioneers of our town were men and women of strong religious tendencies. There was enough of the Puritan spirit in their composition to desire not only the freedom to worship God, but the privilege to worship God as well. By 1797, there had got to be quite a number of families and they had a united feeling for a Sunday service. A petition was made to the tax-payers of the town for a stated amount of preaching. 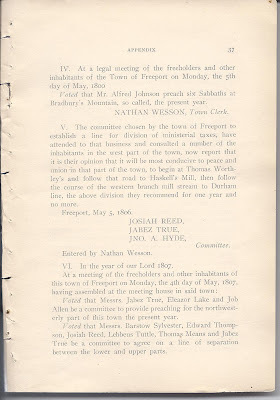 The desire was granted to this extent: That Mr. Alfred Johnson, pastor of the Congregational Church at Freeport, was allowed to go to Bradbury's mountain and preach five Sabbaths in 1798, and five Sabbaths in 1799. Then a second vote was taken that the town would not add one Sabbath to the above. 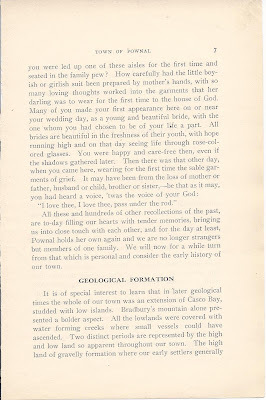 In the records of 1800 we read: Voted that Mr. Alfred Johnson preach six Sabbaths at Bradbury Mountain the present year." 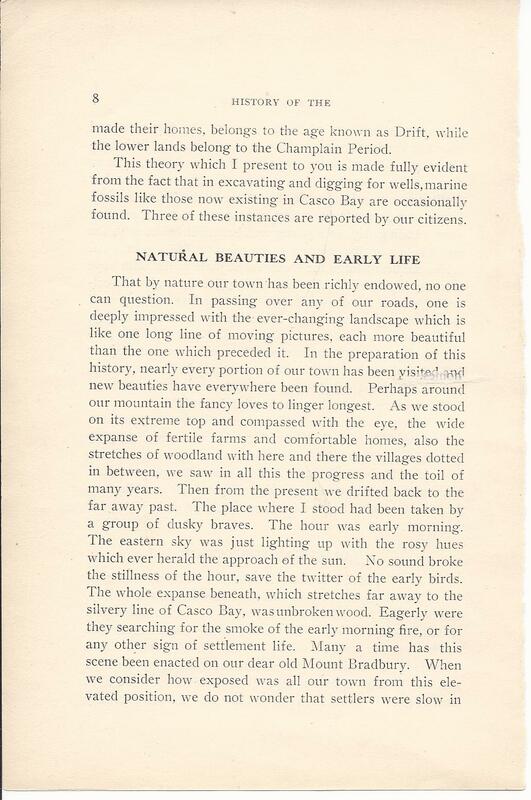 What followed later we have no record of, until in 1807, the year before we became a separate town. 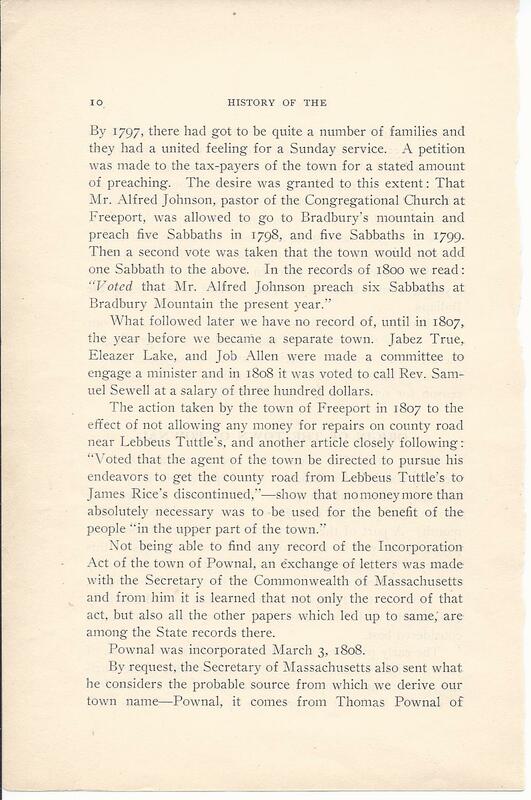 Jabez True, Eleazer Lake and Job Allen were made a committee to engage a minister and in 1808 it was voted to call Rev. Samuel Sewell at a salary of three hundred dollars. 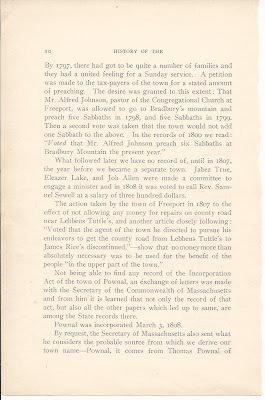 The action taken by the town of Freeport in 1807 to the effect of not allowing any money for repairs on county road near Lebbeus Tuttle's, and another article closely following: "Voted that the agent of the town be directed to pursue his endeavors to get the county road from Lebbeus Tuttle's to James Rice's discontinued," - show that no money more than absolutely necessary was to be used for the benefit of the people "in the upper part of the town." 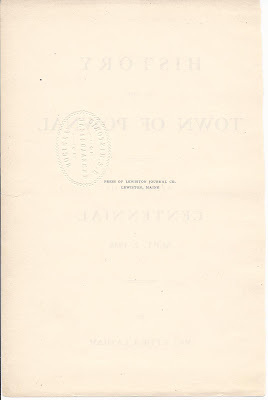 Not being able to find any record of the Incorporation Act of the town of Pownal, an exchange of letters was made with the Secretary of the Commonwealth of Massachusetts and from him it is learned that not only the record of that act, but also all the other papers which led up to same, are among the State records there. 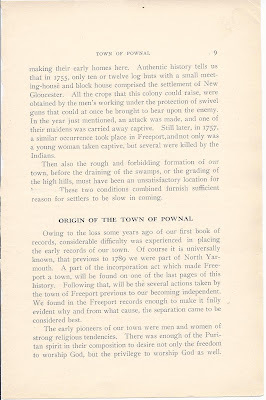 Pownal was incorporated March 3, 1808. England, governor of Massachusetts from 1757 to 1760. Ever after his return to England he remained the firm friend of America and her people. 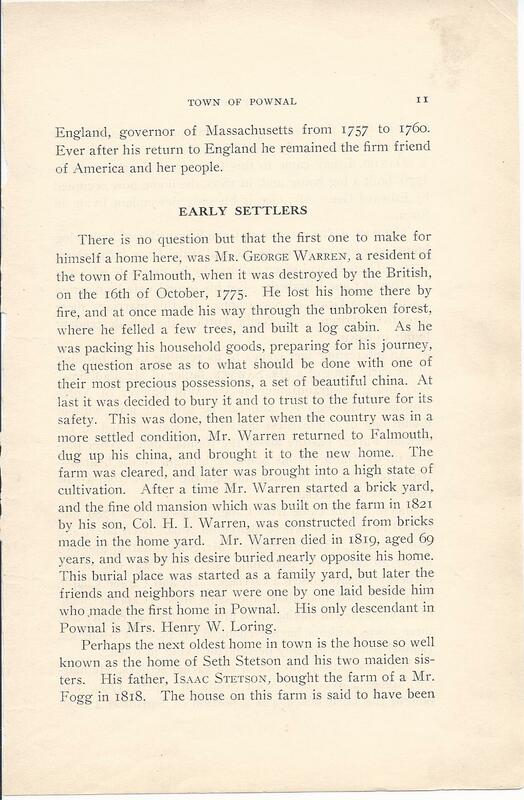 There is no question but that the first one to make for himself a home here, was Mr. George Warren, a resident of the town of Falmouth, when it was destroyed by the British on the 16th of October, 1775. He lost his home there by fire, and at once made his way through the unbroken forest, where he felled a few trees, and built a log cabin. As he was packing his household goods, preparing for his journey, the question arose as to what should be done with one of their most precious possessions, a set of beautiful china. At last it was decided to bury it and to trust to the future for its safety. 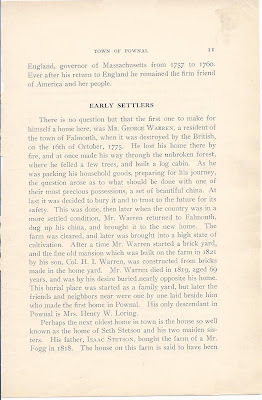 This was done, then later when the country was in a more settled condition, Mr. Warren returned to Falmouth, dug up his china, and brought it to the new home. The farm was cleared, and later was brought into a high state of cultivation. After a time Mr. Warren started a brick yard, and the fine old mansion which was built on the farm in 1821 by his son Col. H. I. Warren, was constructed from bricks made in the home yard. Mr. Warren died in 1819, aged 69 years, and was by his desire buried nearly opposite his home. This burial place was started as a family yard, but later the friends and neighbors near were one by one laid beside him who made the first home in Pownal. His only descendant in Pownal is Mrs. Henry W. Loring. built in 1775, that is, the frame was put up, boarded and shingled, and the family moved into it. Daniel Libby came to this town from Scarborough in 1776, built a log house and, in 1808, the home now occupied by Edward Gee. Mr. Gee is his only descendant living in town. 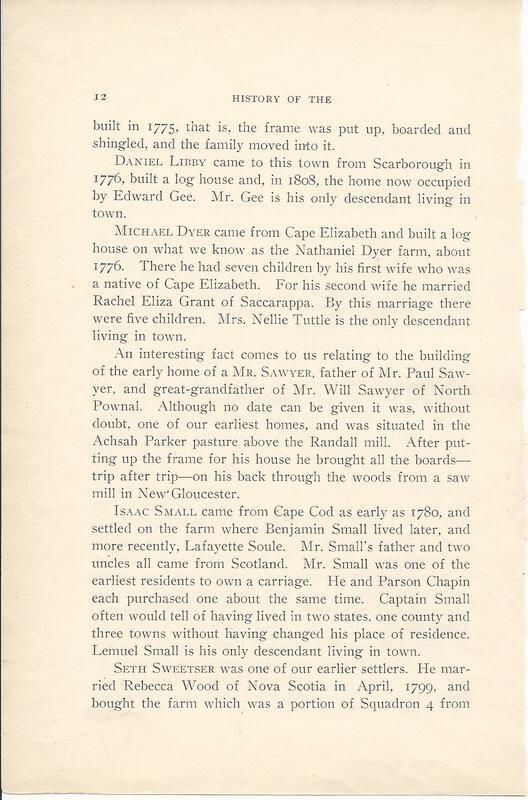 Michael Dyer came from Cape Elizabeth and built a log house on what we know as the Nathaniel Dyer farm, about 1776. There he had seven children by his first wife who was a native of Cape Elizabeth. For his second wife he married Rachel Eliza Grant of Saccarappa. By this marriage there were five children. Mrs. Nellie Tuttle is the only descendant living in town. 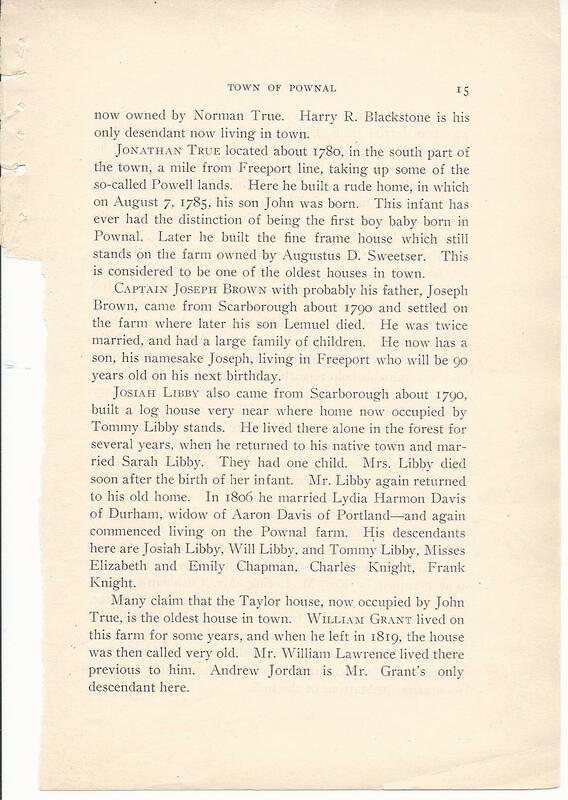 An interesting fact comes to us relating to the building of the early home of a Mr. Sawyer, father of Mr. Paul Sawyer, and great-grandfather of Mr. Will Sawyer of North Pownal. Although no date can be given it was, without doubt, one of our earliest homes, and was situated in the Achsah Parker pasture above the Randall mill. After putting up the frame for his house he brought all the boards - trip after trip - on his back through the woods from a saw mill in New Gloucester. 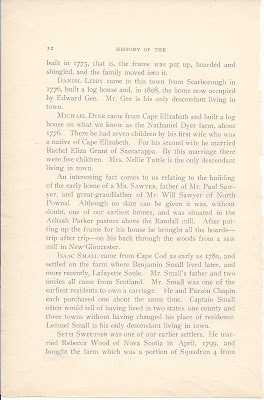 Isaac Small came from Cape Cod as early as 1780, and settled on the farm where Benjamin Small lived later, and more recently, Lafayette Soule. Mr. Small's father and two uncles all came from Scotland. Mr. Small was one of the earliest residents to own a carriage. He and Parson Chapin each purchased one about the same time. Captain Small often would tell of having lived in two states, one county and three towns without having changed his place of residence. Lemuel Small is his only descendant living in town. Mr. Wescott who had first purchased it in company with John Dam. Jonathan Snow now owns the place. Here Mr. Sweetser must have toiled with never-tiring energy, as the long stretches of stone wall which everywhere encircle the land would of themselves testify. The fine frame house still standing was built by him in the early days. A granddaughter tells an interesting story of one of the younger daughters of his large family of ten children. Bethial, an older son, was to be taken to Portland for a fishing trip. To his young sister, Rebecca, only seven years of age, was given the pleasure. This fact of itself alone is enough, but she drove a young four-year-old colt, and made the return trip of twenty miles alone. This courageous child grew to young womanhood, and married a man in Yarmouth, Humphrey by name. She is still living, though very feeble, with her daughter, Mrs. Alice Stockbridge of Yarmouth. Even to old age, Mrs. Humphrey loved a horse, and to-day the picture of her at seventy, mounted on one, hangs in the old Baptist Church at Yarmouth. 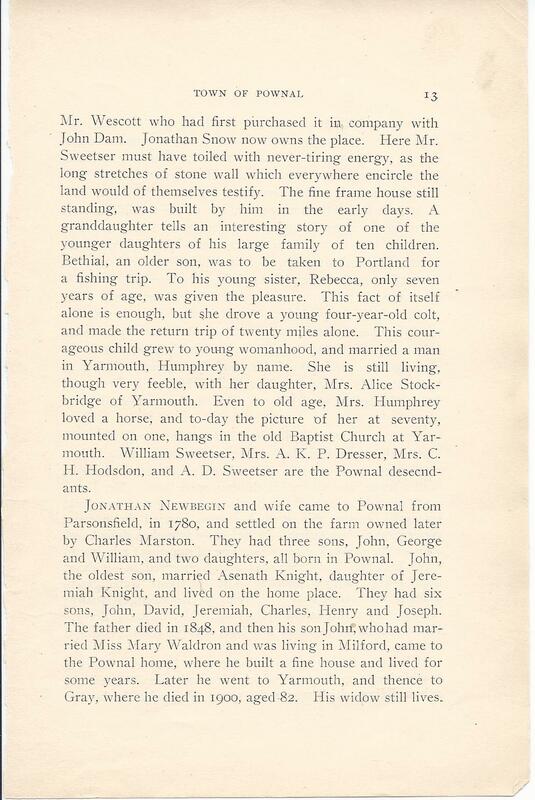 William Sweetser, Mrs. A. K. P. Dresser, Mrs. C. H. Hodsdon, and A. D. Sweetser are the Pownal descendants. 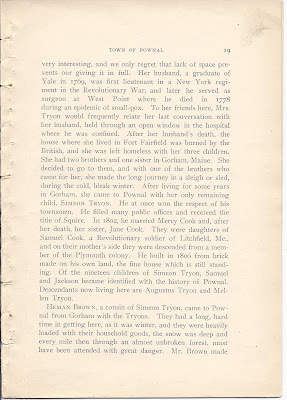 Jonathan Newbegin and wife came to Pownal from Parsonfield, in 1780, and settled on the farm owned later by Charles Marston. 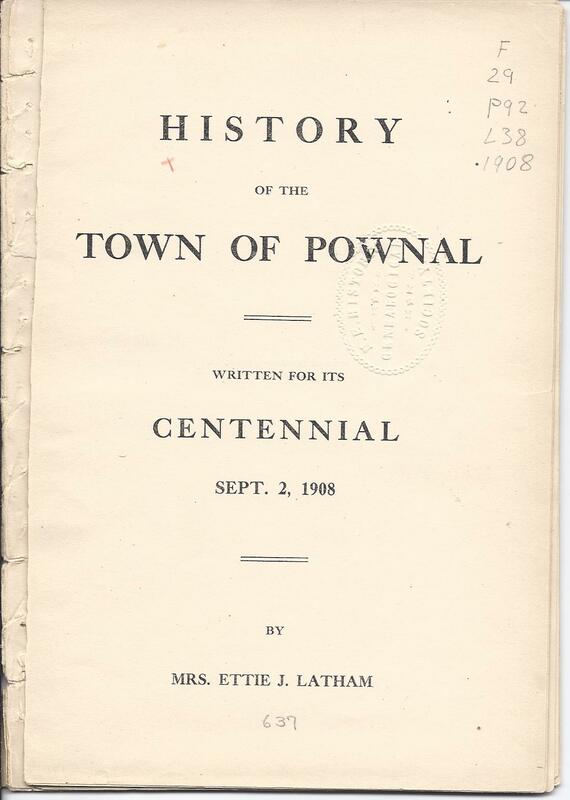 They had three sons, John, George and William, and two daughters, all born in Pownal. 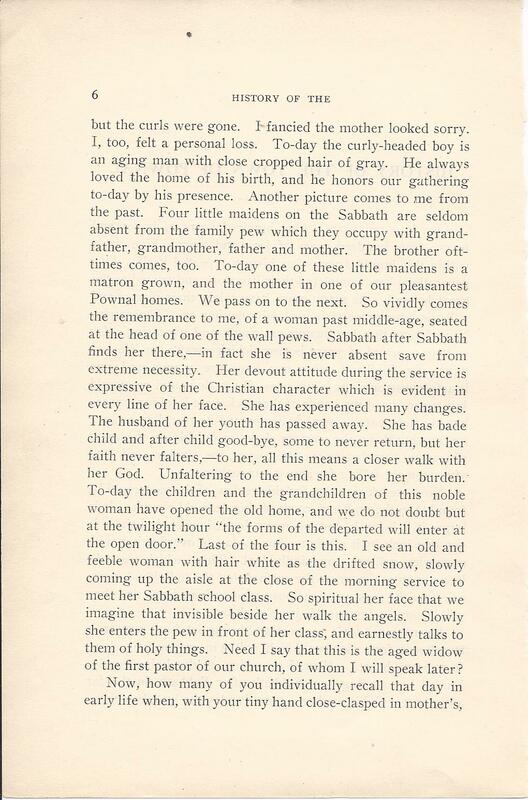 John, the oldest son, married Asenath Knight, daughter of Jeremiah Knight, and lived on the home place. They had six sons, John, David, Jeremiah, Charles, Henry and Joseph. 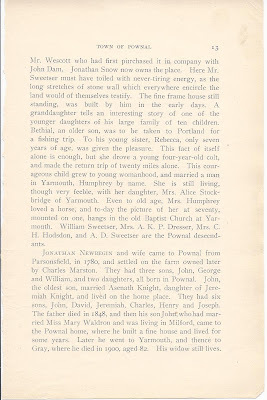 The father died in 1848, and then his son John, who had married Miss Mary Waldron and was living in Milford, came to the Pownal home, where he built a fine house and lived for some years. Later he went to Yarmouth, and thence to Gray, where he died in 1900, aged 82. His widow still lives. Josiah Merrill of Cumberland bought for [pounds] 40 sterling, 50 acres of the Jeremiah Powell lands, commenced clearing on the west side of what is now the Merrill road, one-half mile from the Freeport line. He married Eunice Merrill of Falmouth. They lived in a log house which he built in 1790 before his marriage, and six of their children were born there. Later he built a large one-story frame house on the east of his farm, where the four remaining children were born. Mr. and Mrs. Merrill and their talented children (in fact, all of their descendants), have ever been prominent in the musical, religious and social life of our town. The writer of the early history of this family which it was our good fortunate to obtain, says that he had frequently attended religious gatherings where the entire family took part in the singing. Descendants of Mr. and Mrs. Merrill living in town are: Mr. Horace P. Merrill, Mr. Harlan B. True, and Mrs. Elizabeth Merrill Greene, who resides on the old home place. 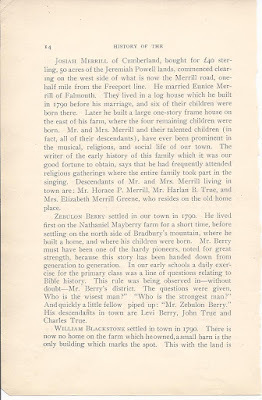 Zebulon Berry settled in our town in 1790. He lived first on the Nathaniel Mayberry farm for a short time, before settling on the north side of Bradbury's mountain, where he built a home, and where his children were born. Mr. Berry must have been one of the hardy pioneers, noted for great strength, because this story has been handed down from generation to generation. 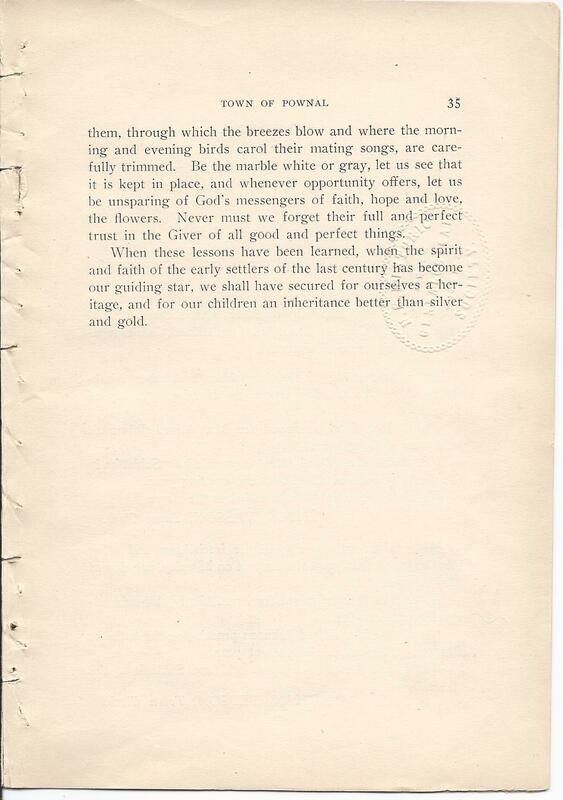 In our early schools a daily exercise for the primary class was a line of questions relating to Bible history. This rule was being observed in - without doubt - Mr. Berry's district. The questions were given, "Who is the wisest man?" "Who is the strongest man?" And quickly a little fellow piped up: "Mr. Zebulon Berry." 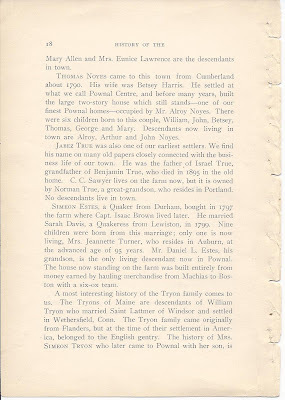 His descendants in town are Levi Berry, John True and Charles True. now owned by Norman True. Harry R. Blackstone is his only descendant now living in town. Jonathan True located about 1780, in the south part of the town, a mile from Freeport line, taking up some of the so-called Powell lands. Here he built a rude home, in which on August 7, 1785, his son John was born. This infant has ever had the distinction of being the first boy baby born in Pownal. Later he built the fine frame house which still stands on the farm owned by Augustus D. Sweetser. This is considered to be of the oldest houses in town. Captain Joseph Brown with probably his father, Joseph Brown, came from Scarborough about 1790 and settled on the farm where later his son Lemuel died. He was twice married, and had a large family of children. He now has a son, his namesake Joseph, living in Freeport who will be 90 years old on his next birthday. 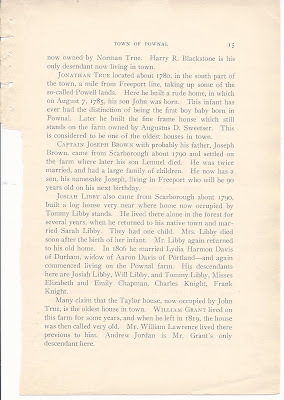 Josiah Libby also came from Scarborough about 1790, built a log house very near where home now occupied by Tommy Libby stands. He lived there alone in the forest for several years, when he returned to his native town and married Sarah Libby. They had one child. Mrs. Libby died soon after the birth of her infant. Mr. Libby again returned to his old home. In 1806 he married Lydia Harmon Davis of Durham, widow of Aaron Davis of Portland - and again commenced living on the Pownal farm. His descendants here are Josiah Libby, Will Libby, and Tommy Libby, Miss Elizabeth and Emily Chapman, Charles Knight, Frank Knight. Many claim that the Taylor house, now occupied by John True, is the oldest house in town. William Grant lived on this farm for some years, and when he left in 1819, the house was then called very old. Mr. William Lawrence lived there previous to him. Andrew Jordan is Mr. Grant's only descendant here. 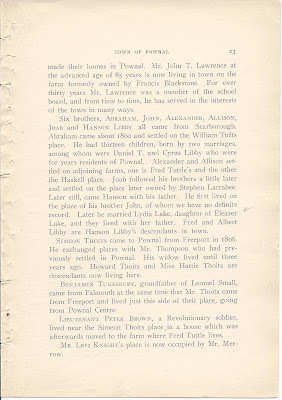 In 1788 the farm now occupied by Mr. Conrad S. Snow was transferred from Elijah Tuttle to Lebbeus Tuttle. There could have been no house on the farm at that time as Mr. Tuttle built a lean-to against a large rock, and there his wife did the work for her family, while the house was being built. A large family of children was born to Mr. and Mrs. Tuttle, but so far as we know, Ernest Tuttle is the only descendant living in town. 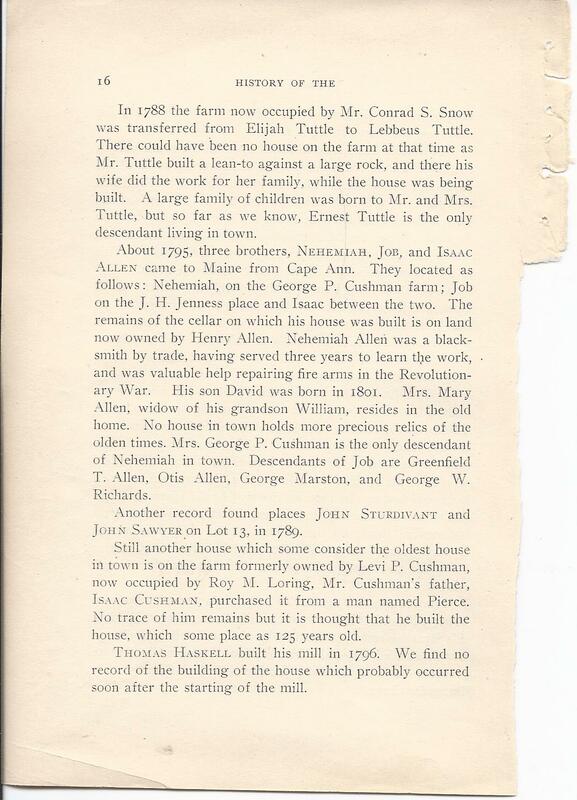 About 1795, three brothers, Nehemiah, Job and Isaac Allen came to Maine from Cape Ann. They located s follows: Nehemiah, on the George P. Cushman farm; Job on the J. H. Jenness place and Isaac between the two. The remains of the cellar on which his house was built is on land now owned by Henry Allen. Nehemiah Allen was a blacksmith by trade, having served three years to learn the work, and was valuable help repairing fire arms in the Revolutionary War. His son David was born in 1801. Mrs. Mary Allen, widow of his grandson William, resides in the old home. No house in town holds more previous relics of the olden times. Mrs. George P. Cushman is the only descendant of Nehemiah in town. Descendants of Job are Greenfield T. Allen, Otis Allen, George Marston and George W. Richards. Another record found places John Sturdivant and John Sawyer on Lot 13, in 1789. Still another house which some consider the oldest house in town is on the farm formerly owned by Levi P. Cushman, now occupied by Roy M. Loring. Mr. Cushman's father, Isaac Cushman, purchased it from a man named Pierce. No trace of him remains but it is thought that he built the house, which some place as 125 years old. Thomas Haskell built his mill in 1796. We find no record of the building of the house which probably occurred soon after the starting of the mill. Thomas Paine was one of our earliest settlers. There is no doubt but that we can safely place him as early as 1790 on the farm now owned by Clarence Leighton. A little story comes to us regarding his wife. They were living in the dense forest when John Dam brought his young bride from Gorham to our town. Mrs. Paine was from Gorham also. When she learned that one from her own town was living near, she lost no time,but made her way up through the dense woods to the new home. Mr. John Dam and Mr. Wescott from Cape Elizabeth in about 1790, took up the land of Squadron A, 450 acres. This squadron in division shows three owners, Haskell, Tuttle and Dam. 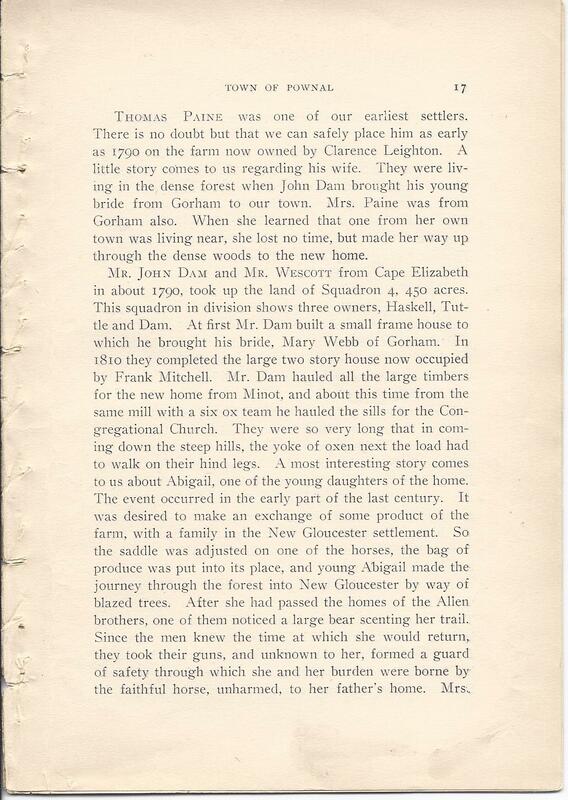 At first Mr. Dam built a small frame house to which he brought his bride, Mary Webb of Gorham. In 1810 they completed the large two story house now occupied by Frank Mitchell. Mr. Dam hauled all the large timbers for the new home from Minot, and about this time from the same mill with a six ox team he hauled the sills for the Congregational Church. They were so very long that in coming down the steep hills, the yoke of oxen next the load had to walk on their hind legs. 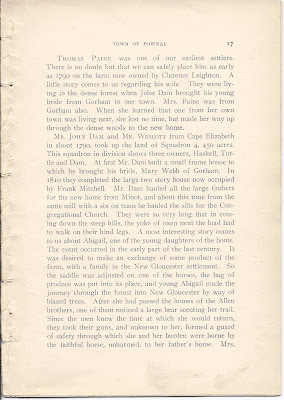 A most interesting story comes to us about Abigail, one of the young daughters of the home. The event occurred in the early part of the last century. It was desired to make an exchange of some product of the farm, with a family in the New Gloucester settlement. So the saddle was adjusted on one of the horses, the bag of produce was put into its place, and young Abigail made the journey through the forest into New Gloucester by way of blazed trees. After she had passed the homes of the Allen brothers, one of them noticed a large bear scenting her trail. Since the men knew the time at which she would return, they took their guns, and unknown to her, formed a guard of safety through which she and her burden were borne by the faithful horse, unharmed, to her father's home. 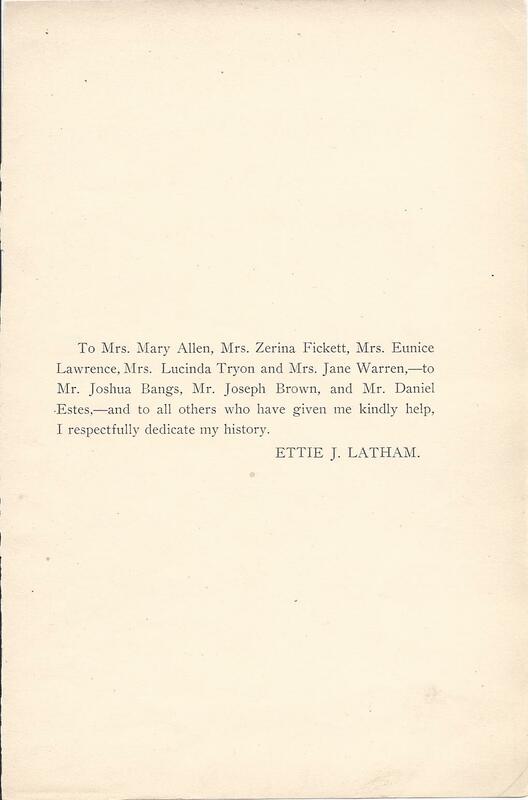 Mrs.
Mary Allen and Mrs. Eunice Lawrence are the descendants in town. Thomas Noyes came to this town from Cumberland about 1790. His wife was Betsey Harris. 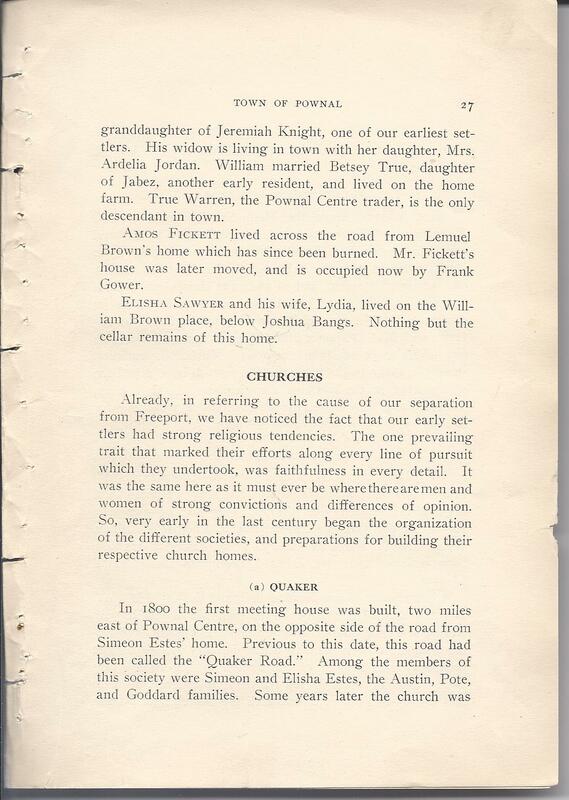 He settled at what we call Pownal Centre, and before many years, built the large two-story house which still stands - one of our finest Pownal homes - occupied by Mr. Alroy Noyes. There were six children born to this couple, William, John, Betsey, Thomas, George and Mary. 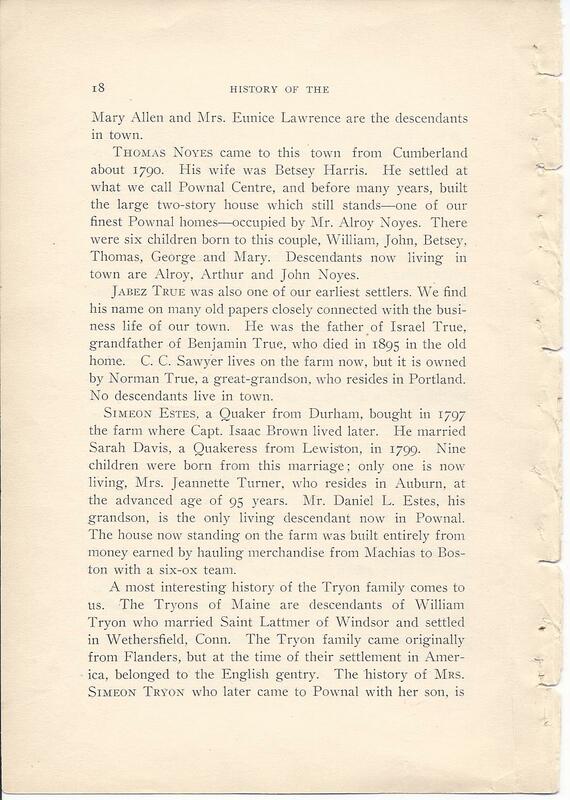 Descendants now living in town are Alroy, Arthur and John Noyes. Jabez True was also one of our earliest settlers. We find his name on many old papers closely connected with the business life of our town. He was the father of Israel True, grandfather of Benjamin True, who died in 1895 in the old home. C. C. Sawyer lives on the farm now, but it is owned by Normal True, a great-grandson, who resides in Portland. No descendants live in town. Simeon Estes, a Quaker from Durham, bought in 1797 the farm where Capt. Isaac Brown lived later. He married Sarah Davis, a Quakeress from Lewiston, in 1799. Nine children were born from this marriage: only one is now living, Mrs. Jeannette Turner, who resides in Auburn, at the advanced age of 95 years. Mr. Daniel L. Estes, his grandson, is the only living descendant now in Pownal. The house now standing on the farm was built entirely from money earned by hauling merchandise from Machias to Boston with a six-ox team. very interesting, and we only regret that lack of space prevents our giving it in full. Her husband, a graduate of Yale in 1769, was first lieutenant in a New York regiment in the Revolutionary War, and later he served as surgeon at West Point where he died in 1778 during an epidemic of small-pox. 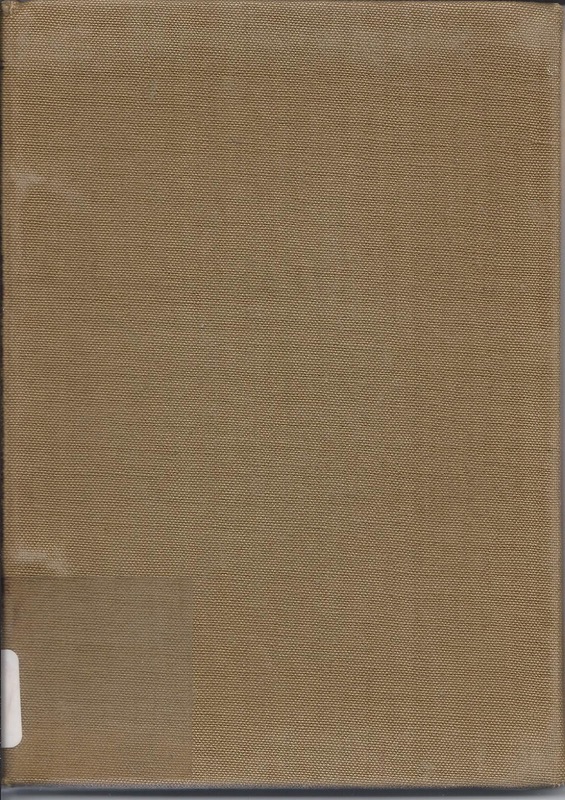 To her friends here, Mrs. Tryon would frequently relate her last conversation with her husband, held through an open window in the hospital where he was confined. After her husband's death, the house where she lived in Fort Fairfield was burned by the British, and she was left homeless with her three children. 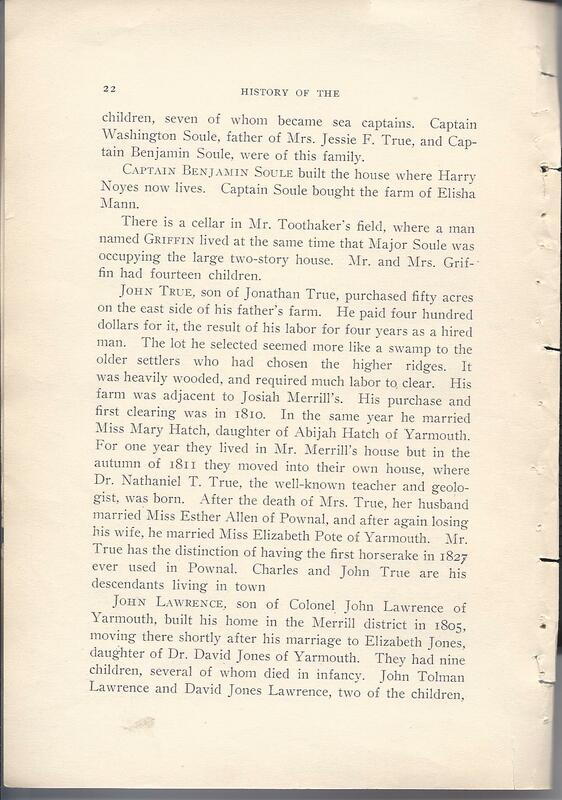 Se had two brothers and one sister in Gorham, Maine. She decided to go to them, and with one of the brothers who came for her, she made the long journey in a sleigh or sled, during the cold, bleak winter. After living for some years in Gorham, she came to Pownal with her only remaining child, Simeon Tryon. He at once won the respect of his townsmen. He filled many public offices and received the title of Squire. In 1802, he married Mercy Cook and, after her death, her sister, Jane Cook. They were daughters of Samuel Cook, a Revolutionary soldier of Litchfield, Maine, and on their mother's side they were descended from a member of the Plymouth colony. He built in 1806 from brick made on his own land, the fine house which is still standing. Of the nineteen children of Simeon Tryon, Samuel and Jackson became identified with the history of Pownal. Descendants now living here are Augustus Tryon and Mellen Tryon. his first home over on the hill, quite a distance across the road from the large two-story house he built later. This farm was last owned by Lewis Lackey, and was, perhaps fifteen years ago, destroyed by fire. It is a matter of much regret that three other of our older houses have met the same fate. In speaking of so many others, we must not forget the Chapin home which we all love so well, for it was built by Parson Chapin and has always been and is still, the home of his descendants. To this farm in the early part of the last century, the first pastor of the Congregational Church brought his young bride, who was Miss Sarah Wright of Whitehall, New York. Here their eight children were born. The last of the family, - Mr. Perez Chapin - died about three years ago. A granddaughter of Mr. and Mrs. Chapin - Miss Mary B. Chapin from Michigan - now owns the home, and to her heart she has taken the church, Pownal and its people. Benjamin Mitchell was one of our earliest settlers, occupying the home now owned by his daughter, Mrs. Zerina Fickett, widow of the late Nathaniel Fickett. Mr. Soule was for many years deacon of the Congregational Church. Mrs. Fickett related to us the interesting story of how her grandmother, Mrs. Mary Lewis of North Yarmouth, came to the dedication of our church in 1811. 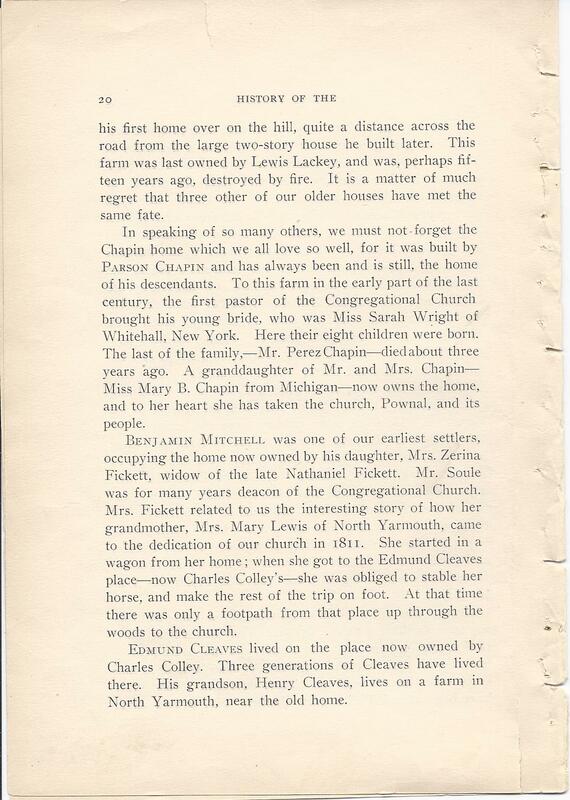 She started in a wagon from her home; when she got to the Edmund Cleaves place - now Charles Colley's - she was obliged to stable her horse, and make the rest of the trip on foot. At that time, there was only a footpath from that place up through the woods to the church. Edmund Cleaves lived on the place now owned by Charles Colley. Three generations of Cleaves have lived there. His grandson, Henry Cleaves, lives on a farm in North Yarmouth, near the old home. 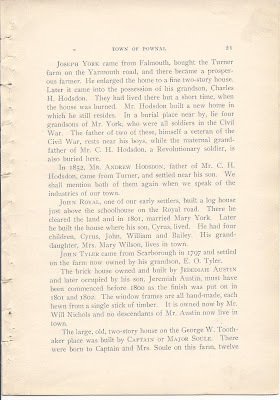 Joseph York came from Falmouth, bought the Turner farm on the Yarmouth road, and there became a prosperous farmer. He enlarged the home to a fine two-story house. Later it came into the possession of his grandson, Charles H. Hodsdon. They had lived there but a short time, when the house was burned. Mr. Hodsdon built a new home in which he still resides. In a burial place near by, lie four grandsons of Mr. York, who were all soldiers in the Civil War. The father of two of these, himself a veteran of the Civil War, rests near his boys, while the maternal grandfather of Mr. C. H. Hodsdon, a Revolutionary soldier, is also buried there. 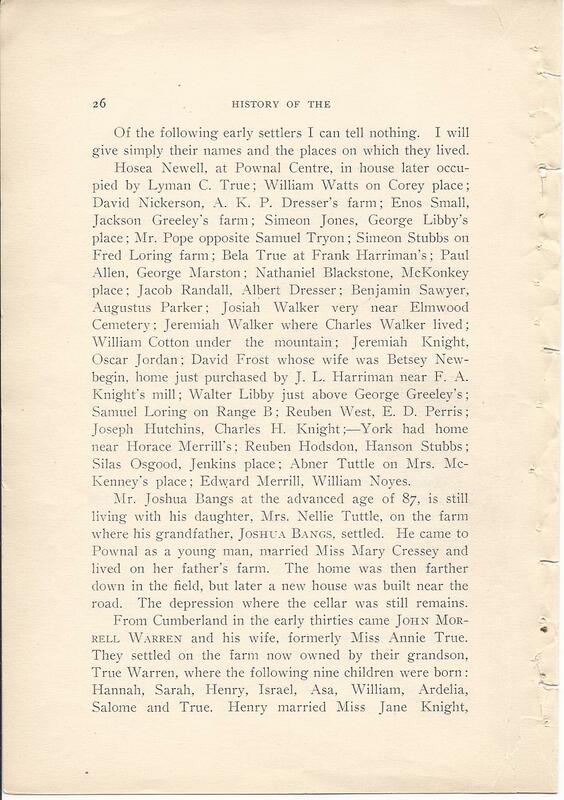 In 1852, Mr. Andrew Hodsdon, father of Mr. C. H. Hodsdon, came from Turner and settled near his son. We shall mention both of them again when we speak of the industries of our town. John Royal, one of our early settlers, built a log house just above the schoolhouse on the Royal road. There he cleared the land and in 1801, married Mary York. Later he built the house where his son, Cyrus, lived. He had four children, Cyrus, John, William and Bailey. His granddaughter, Mrs. Mary Wilson, lives in town. 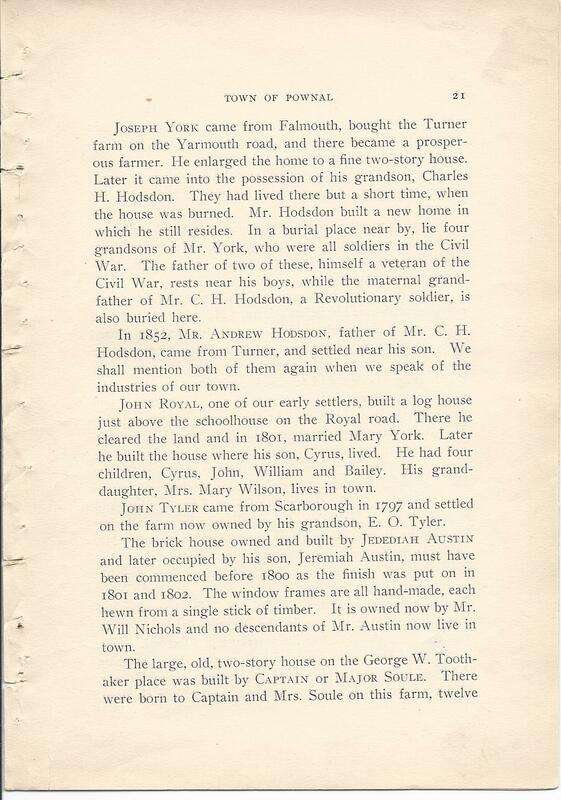 John Tyler came from Scarborough in 1797 and settled on the farm now owned by his grandson, E. O. Tyler. The brick house owned and built by Jedediah Austin and later occupied by his son, Jeremiah Austin, must have been commenced before 1800 as the finish was put on in 1801 and 1802. The window frames are all hand-made, each hewn from a single stick of timber. It is owned now by Mr. Will Nichols and no descendants of Mr. Austin now live in town. children, seven of whom became sea captains. Captain Washington Soule, father of Mrs. Jessie F. True, and Captain Benjamin Soule, were of this family. Captain Benjamin Soule built the house where Harry Noyes now lives. 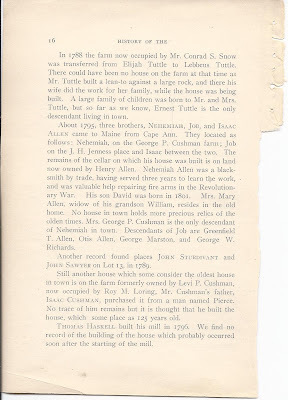 Captain Soule bought the farm of Elisha Mann. There is a cellar in Mr. Toothaker's field, where a man named Griffin lived at the time same that Major Soule was occupying the large two-story house. Mr. and Mrs. Griffin had fourteen children. 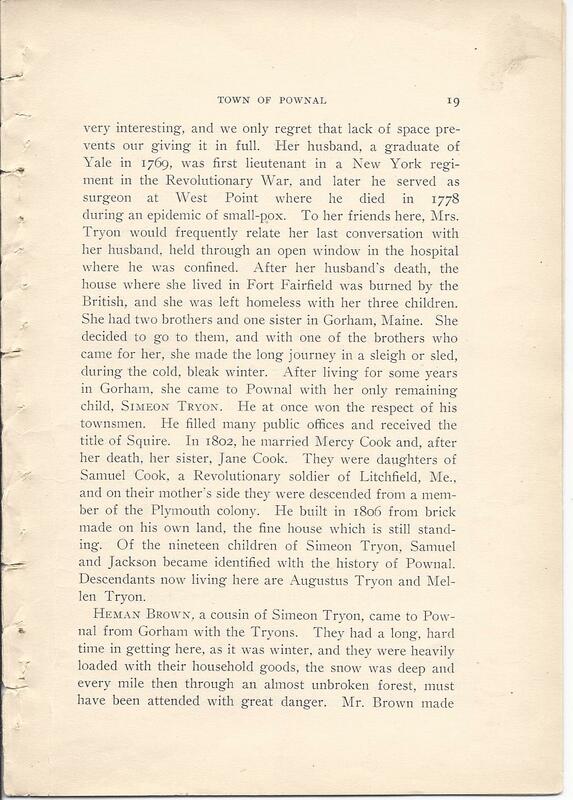 John True, son of Jonathan True, purchased fifty acres on the east side of his father's farm. He paid four hundred dollars for it, the result of his labor for four years as a hired man. The lot he selected seemed more like a swamp to the older settlers who had chosen the higher ridges. It was heavily wooded, and required much labor to clear. His farm was adjacent to Josiah Merrill's. His purchase and first clearing was in 1810. In the same year he married Miss Mary Hatch, daughter of Abijah Hatch of Yarmouth. For one year they lived in Mr. Merrill's house but in the autumn of 1811 they moved into their own house, where Dr. Nathaniel T. True, the well-known teacher and geologist, was born. After the death of Mrs. True, her husband married Miss Esther Allen of Pownal, and after again losing his wife, he married Miss Elizabeth Pote of Yarmouth. Mr. 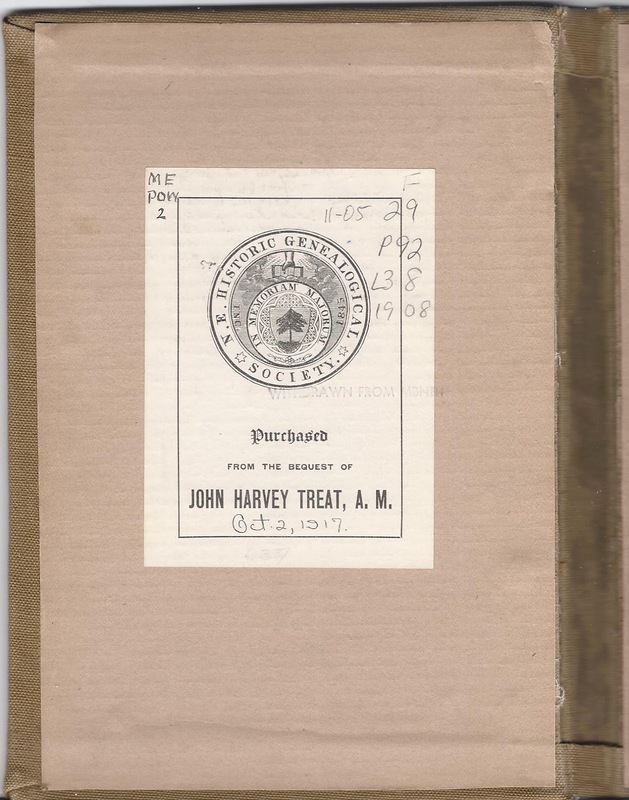 True hs the distinction of having the first horserake in 1827 ever used in Pownal. Charles and John True are his descendants living in town. made their homes in Pownal. Mr. John T. Lawrence at the advanced age of 85 years is now living in town on the farm formerly owned by Francis Blackstone. For over thirty years Mr. Lawrence was a member of the school board, and from time to time, he has served in the interests of the town in many ways. Six brothers, Abraham, John, Alexander, Allison, Joab and Hanson Libby all came from Scarborough. Abraham came about 1800 and settled on the William Tufts place. He had thirteen children, born by two marriages, among whom were Daniel T. and Cyrus Libby who were for years residents of Pownal. Alexander and Allison settled on adjoining farms, one is Fred Tuttle's and the other the Haskell place. Joab followed his brothers a little later and settled on the place later owned by Stephen Larrabee. Later still, came Hanson with his father. He first lived on the place of his brother John, of whom we have no definite record. Later he married Lydia Lake, daughter of Eleazer Lake, and they lived with her father. Fred and Albert Libby are Hanson Libby's descendants in town. Simeon Thoits came to Pownal from Freeport in 1806. He exchanged places with Mr. Thompson who had previously settled in Pownal. His widow lived until three years ago. Howard Thoits and Miss Hattie Thoits are descendants now living here. 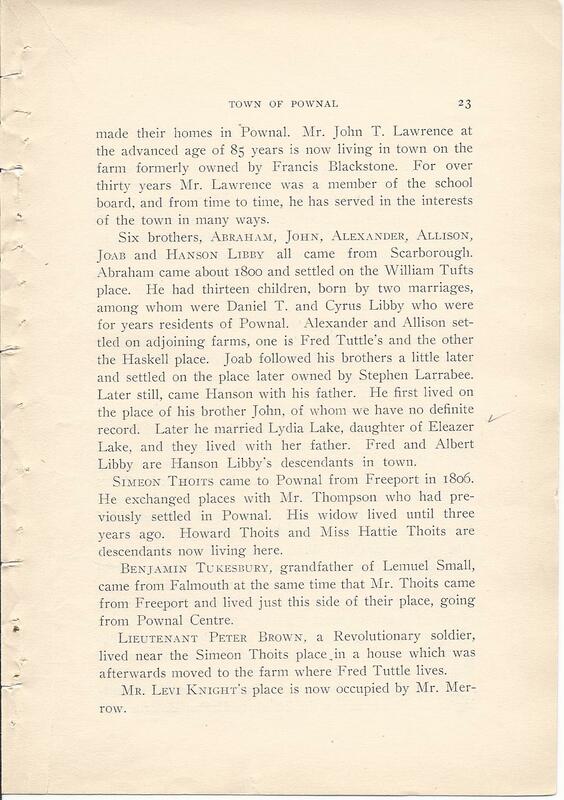 Benjamin Tukesbury, grandfather of Lemuel Small, came from Falmouth at the same time that Mr. Thoits came from Freeport and lived just this side of their place, going from Pownal Centre. Lieutenant Peter Brown, a Revolutionary soldier, lived near the Simeon Thoits place in a house which was afterwards moved to the farm where Fred Tuttle lives. Mr. Levi Knight's place is now occupied by Mr. Merrow. Eleazer Lake lived on the place where Bradbury Libby lived. 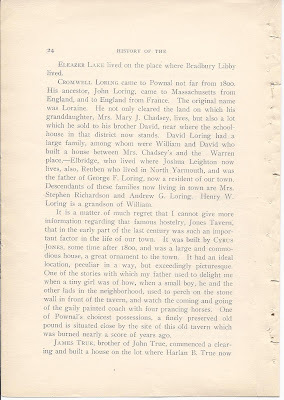 Cromwell Loring came to Pownal not far from 1800. His ancestor, John Loring, came to Massachusetts from England, and to England from France. The original name was Loraine. He not only cleared the land on which his granddaughter, Mrs. Mary J. Chadsey, lives, but also a lot which he sold to his brother David, near where the schoolhouse in that district now stands. 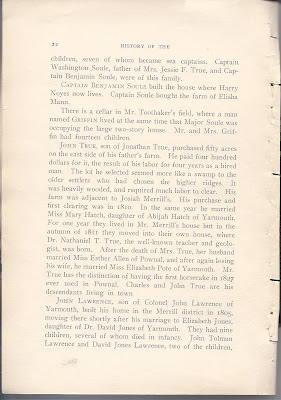 David Loring had a large family, among whom were William and David who built a house between Mrs. Chadsey's and the Warren place, - Elbridge, who lived where Joshua Leighton now lives, also Reuben who lived in North Yarmouth and was the father of George F. Loring, now a resident of our town. Descendants of these families now living in town are Mrs. Stephen Richardson and Andrew G. Loring. Henry W. Loring is a grandson of William. 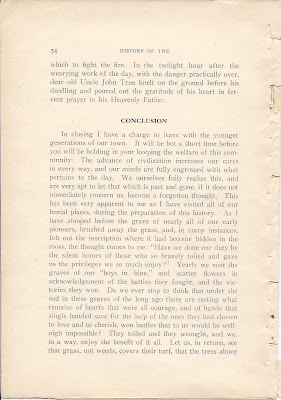 It is a matter of much regret that I cannot give more information regarding that famous hostelry, Jones Tavern, that in the early part of the last century was such an important factor in the life of our town. It was built by Cyrus Jones, some time after 1800, and was a large and commodious house, a great ornament to the town. It had an ideal location, peculiar in a way, but exceedingly picturesque. One of the stories with which my father used to delight me when a tiny girl was of how, when a small boy, he and the other lads in the neighborhood, used to perch on the stone wall in front of the tavern, and watch the coming and going of the gaily painted coach with four prancing horses. One of Pownal's choicest possessions, a finely preserved old pound, is situated close by the site of this old tavern which was burned nearly a score of years ago. lives. This was about 1815. Later he sold the place, and Mr. Harlan B. True's father, Mr. Elbridge True, came there from Freeport. 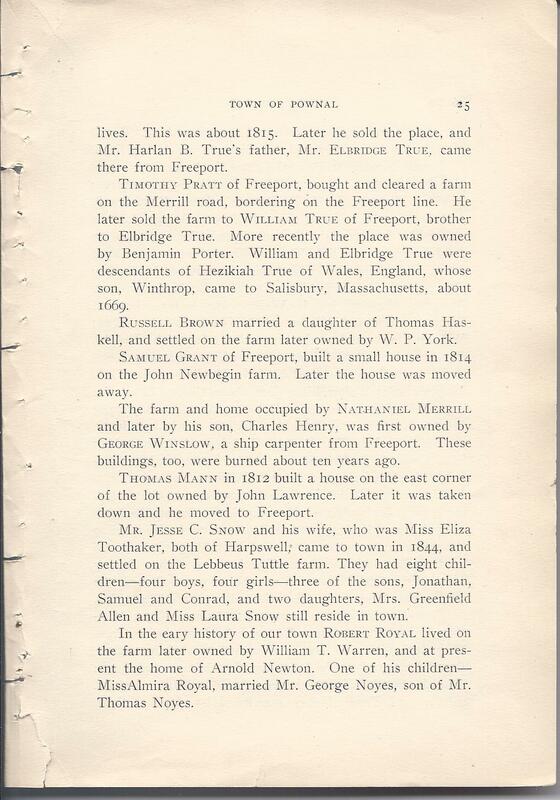 Timothy Pratt of Freeport, bought and cleared a farm on the Merrill road, bordering on the Freeport line. 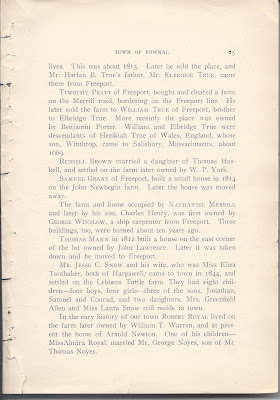 He later sold the farm to William True of Freeport, brother to Elbridge True. More recently the place was owned by Benjamin Porter. William and Elbridge True were descendants of Hezekiah True of Wales, England, whose son Winthrop, came to Salisbury, Massachusetts, about 1669. Russell Brown married a daughter of Thomas Haskell and settled on the farm later owned by W. P. York. Samuel Grant of Freeport built a small house in 1814 on the John Newbegin farm. Later the house was moved away. The farm and home occupied by Nathaniel Merrill and later by his son Charles Henry, was first owned by George Winslow, a ship carpenter from Freeport. These buildings, too, were burned about ten years ago. Thomas Mann in 1812 built a house on the east corner of the lot owned by John Lawrence. Later it was taken down and he moved to Freeport. 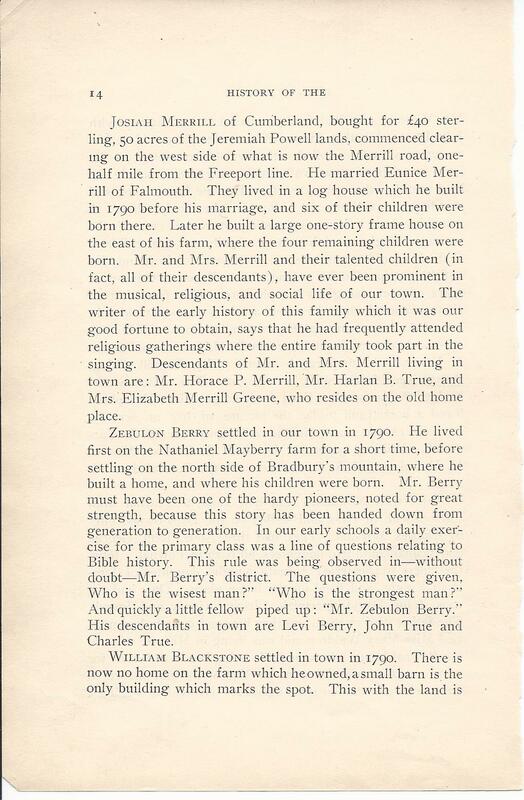 Mr. Jesse C. Snow and his wife, who was Miss Eliza Toothaker, both of Harpswell, came to town in 1844 and settled on the Lebbeus Tuttle farm. They had eight children - four boys, four girls - three of the sons, Jonathan, Samuel and Conrad, and two daughters, Mrs. Greenfield Allen and Miss Laura Snow still reside in town. In the early history of our town Robert Royal lived on the farm later owned by William T. Warren, and at present the home of Arnold Newton. One of his children - Miss Almira Royal, married Mr. George Noyes, son of Mr. Thomas Noyes. Of the following early settlers, I can tell nothing. I will give simply their names and the places on which they lived. 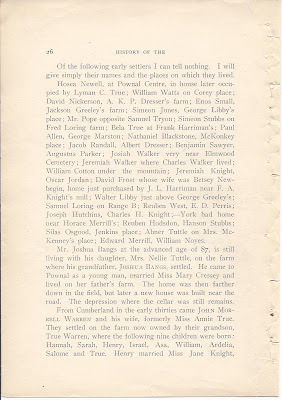 Hosea Newell, at Pownal Centre, in house later occupied by Lyman C. True; William Watts on Corey place; David Nickerson, A. K. P. Dresser's farm; Enos Small, Jackson Greeley's farm; Simeon Jones, George Libby's place; Mr. Pope opposite Samuel Tryon; Simeon Stubbs on Fred Loring farm; Bela True at Frank Harriman's; Paul Allen, George Marston; Nathaniel Blackstone, McKonkey place; Jacob Randall, Albert Dresser; Benjamin Sawyer, Augustus Parker; Josiah Walker very near Elmwood Cemetery; Jeremiah Walker where Charles Walker lived; William Cotton under the mountain; Jeremiah Knight, Oscar Jordan; David Frost, whose wife was Betsey Newbegin, home just purchased by J. L. Harriman near F. A. Knight's mill; Walter Libby just above George Greeley's; Samuel Loring on Range B; Reuben West, E. D. Perris; Joseph Hutchins, Charles H. Knight; __ York had home near Horace Merrill's; Reuben Hodsdon, Hanson Stubbs; Silas Osgood, Jenkins place; Abner Tuttle on Mrs. McKenney's place; Edward Merrill, William Noyes. Mr. Joshua Bangs at the advanced age of 87, is still living with his daughter, Mrs. Nellie Tuttle, on the farm where his grandfather, Joshua Bangs, settled. He came to Pownal as a young man, married Miss Mary Cressey and lived on her father's farm. The home was then farther down in the field, but later a new house was built near the road. The depression where the cellar was still remains. granddaughter of Jeremiah Knight, one of our earliest settlers. His widow is living in town with her daughter, Mrs. Ardelia Jordan. William married Betsey True, daughter of Jabez, another early resident, and lived on the home farm. 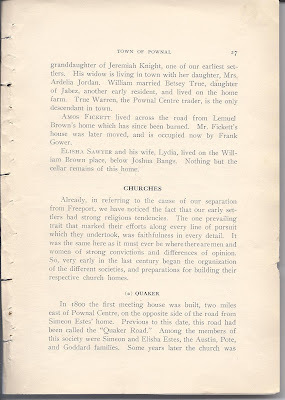 True Warren, the Pownal Centre trader, is the only descendants in town. Amos Fickett lived across the road from Lemuel Brown's home which has since been burned. Mr. Fickett's house was later moved, and is occupied now by Frank Gower. Elisha Sawyer and his wife, Lydia, lived on the William Brown place, below Joshua Bangs. Nothing but the cellar remains of this home. Already, in referring to the cause of our separation from Freeport, we have noticed the fact that our early settlers had strong religious tendencies. The one prevailing trait that marked their efforts along every line of pursuit which they undertook, was faithfulness in every detail. It was the same here as it must ever be where there are men and women of strong convictions and differences of opinion. So, very early in the last century began the organization of the different societies, and preparations for building their respective church homes. moved to a location near the Goddard farm, where it continued to be a place of worship until 1850. It was finally burned. 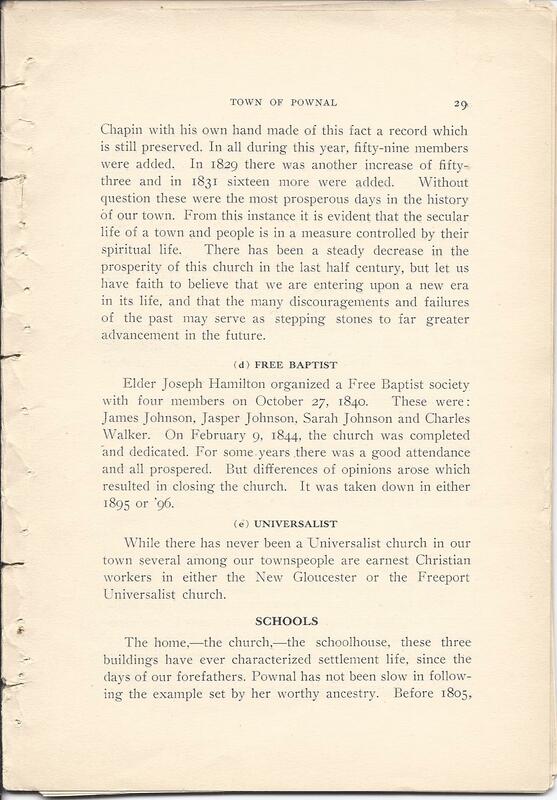 Next in order came the Methodist Episcopal church. As early as 1808 this organization was formed by Pownal and Durham families. 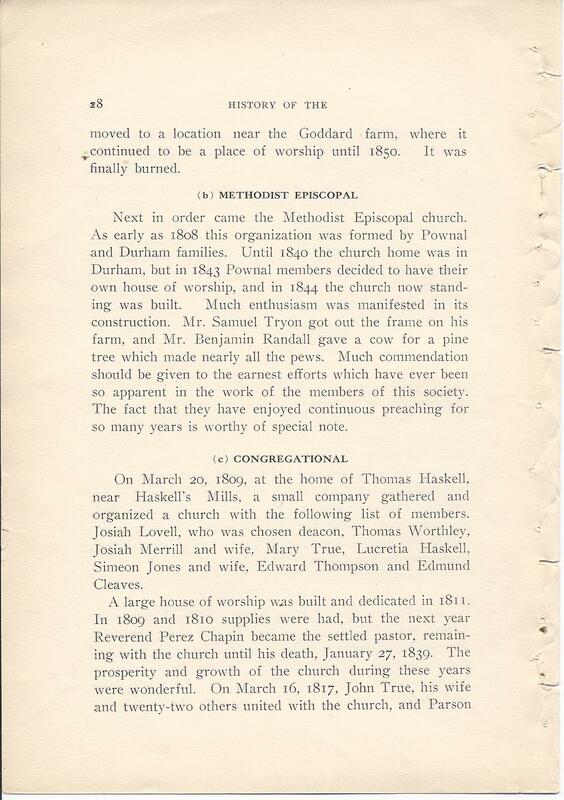 Until 1840 the church home was in Durham, but in 1843, Pownal members decided to have their own house of worship, and in 1844 the church now standing was built. Much enthusiasm was manifested in its construction. 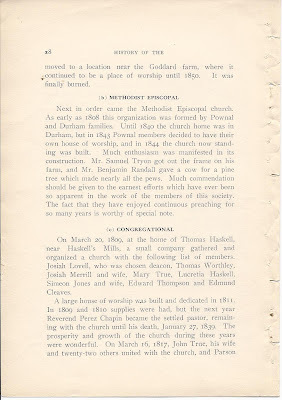 Mr. Samuel Tryon got out the frame on his farm, and Mr. Benjamin Randall gave a cow for a pine tree which made nearly all the pews. Much commendation should be given to the earnest efforts which have ever been so apparent in the work of the members of this society. The fact that they have enjoyed continuous preaching for so many years is worthy of special note. On March 20, 1809, at the home of Thomas Haskell, near Haskell's Mills, a small company gathered and organized a church with the following list of members. Josiah Lovell, who was chosen deacon, Thomas Worthley, Josiah Merrill and wife, Mary True, Lucretia Haskell, Simeon Jones and wife, Edward Thompson and Edmund Cleaves. Chapin with his own hand made of this fact a record which is still preserved. In all during this year, fifty-nine members were added. In 1829 there was another increase of fifty-three and in 1831 sixteen more were added. 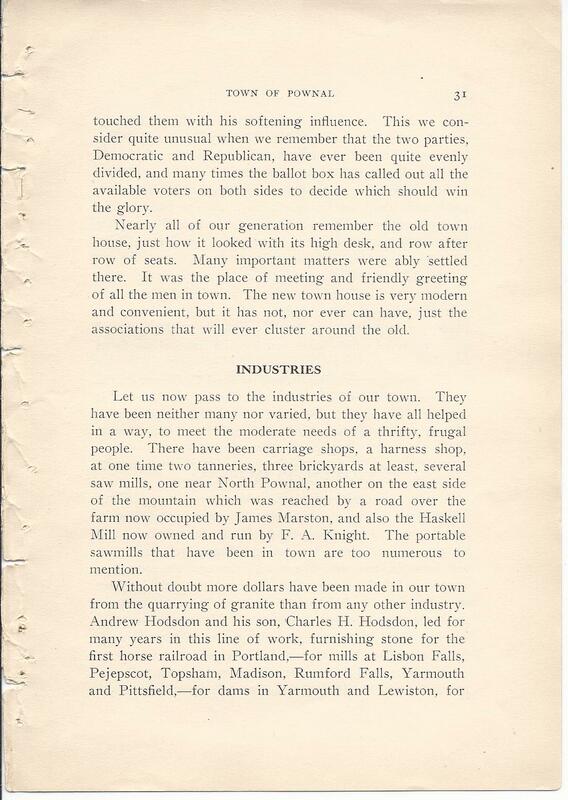 Without question these were the most prosperous days in the history of our town. From this instance it is evident that the secular life of a town and people is in a measure controlled by their spiritual life. 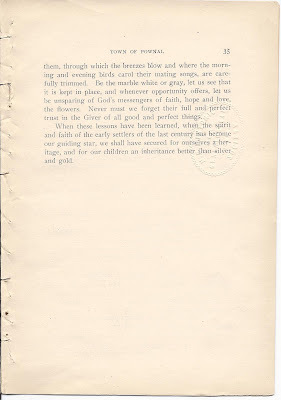 There has been a steady decrease in the prosperity of this church in the last half century, but let us have faith to believe that we are entering upon a new era in its life, and that the many discouragements and failures of the past may serve as stepping stones to far greater advancement in the future. 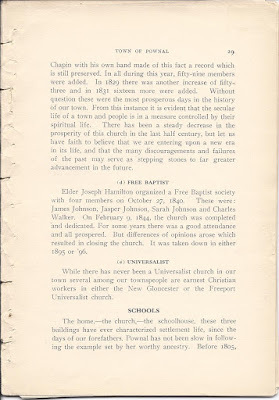 Elder Joseph Hamilton organized a Free Baptist society with four members on October 27, 1840. These were: James Johnson, Jasper Johnson, Sarah Johnson and Charles Walker. On February 9, 1844, the church as completed and dedicated. For some years there was good attendance and all prospered. But differences of opinion arose which resulted in closing the church. It was taken down in either 1895 or '96. While there has never been a Universalist church in our town several among our townspeople are earnest Christian workers in either the New Gloucester or the Freeport Universalist church. 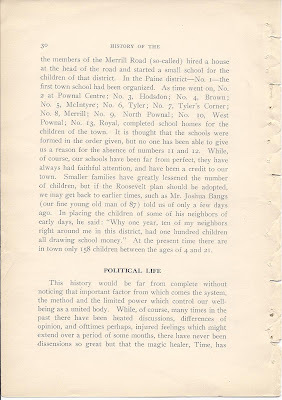 the members of the Merrill Road (so-called) hired a house at the head of the road and started a small school for the children of that district. In the Paine district - No. 1 - the first town school had been organized. As time went on, No. 2 at Pownal Centre; No. 3, Hodsdon; No. 4, Brown; No. 5, McIntyre; No. 6, Tyler; No. 7, Tyler's Corner; No. 8, Merrill; No. 9, North Pownal; No. 10, West Pownal; No. 13, Royal, completed school homes for the children of the town. It is thought that the schools were formed in the order given, but no one has been able to give us a reason for the absence of numbers 11 and 12. While, of course, our schools have been far from perfect, they have always had faithful attention, and have been a credit to our town. 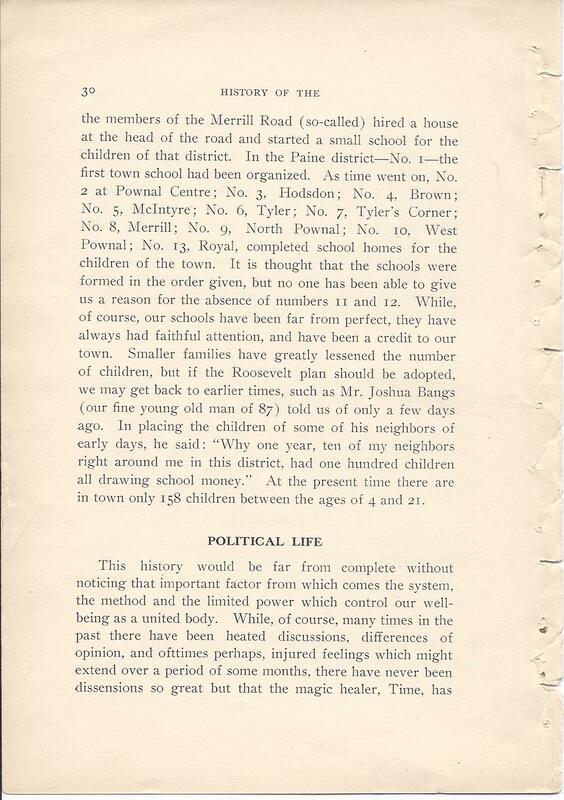 Smaller families have greatly lessened the number of children, but if the Roosevelt plan should be adopted, we may get back to earlier times, such as Mr. Joshua Bangs (our fine young old man of 87) told us of only a few days ago. In placing the children of some of his neighbors of early days, he said: "Why one year, ten of my neighbors right around me in this district, had one hundred children all drawing school money." At the present time there are in town only 158 children between the ages of 4 and 21.
touched them with his softening influence. This we consider quite unusual when we remember that the two parties, Democratic and Republic, have ever been quite evenly divided, and many times the ballot box has called out all the available voters on both sides to decide which should win the glory. Nearly all of our generation remember the old town house, just how it looked with its high desk, and row after row of seats. Many important matters were ably settled there. It was the place of meeting and friendly greeting of all the men in town. The new town house is very modern and convenient, but it has not, nor ever can have, just the associations that will ever cluster around the old. Let us now pass to the industries of our town. They have been neither many nor varied, but they have all helped in a way, to meet the moderate needs of a thrifty, frugal people. 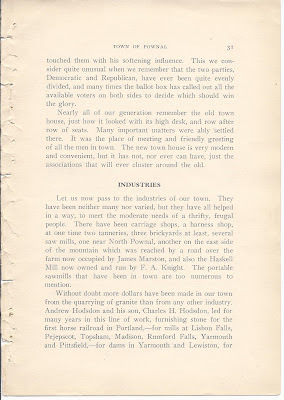 There have been carriage shops, a harness shop, at one time two tanneries, three brickyards at least, several saw mills, one near North Pownal, another on the east side of the mountain which was reached by a road over the farm now occupied by James Marston, and also the Haskell Mill now owned and run by F. A. Knight. The portable sawmills that have been in town are too numerous to mention. many schools, churches and private dwellings in this county. They cut arches for Pillsbury Flour Mills at Minneapolis and sent curb stones and quarter circles to St. Paul, Minneapolis and Cincinnati. Sewell Reed, a descendant of Josiah Reed, also had a fine quarry near the Yarmouth line. At one time he did a large business and he still has the distinction of quarrying and sending out the heaviest stone ever shipped from Pownal. Its weight was fourteen tons. Mr. Charles H. Knight now owns and operates each year to a considerable extent a quarry in North Yarmouth, near the Pownal line. 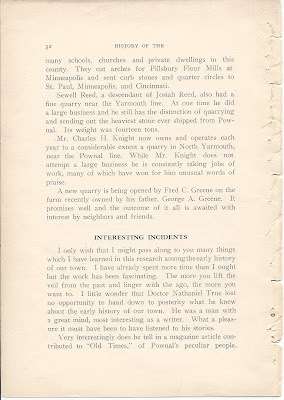 While Mr. Knight does not attempt a large business he is constantly taking jobs of work, many of which have won for him unusual words of praise. A new quarry is being opened by Fred C. Greene on the farm recently owned by his father, George A. Greene. It promises well and the outcome of it all is awaited with interest by neighbors and friends. I only wish that I might pass along to you many things which I have learned in this research among the early history of our town. I have already spent more time than I ought but the work has been fascinating. The more you life the veil from the past and linger with the ago, the more you want to. 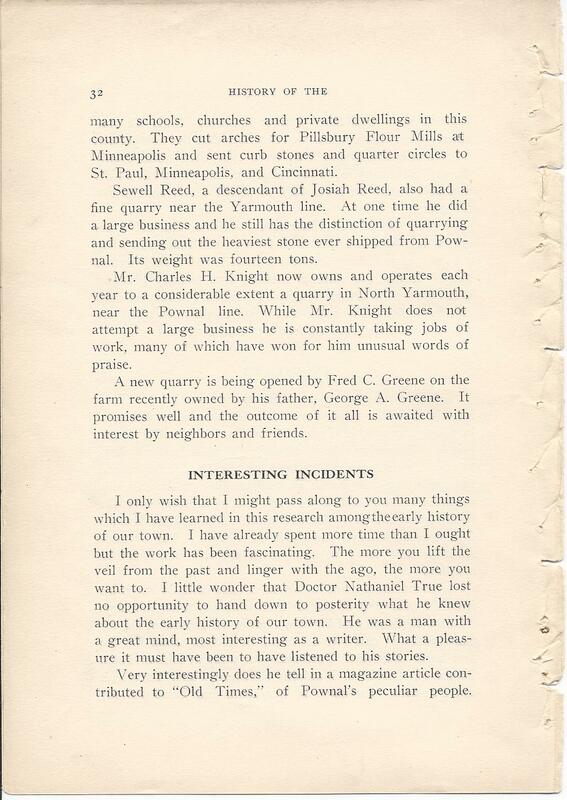 I little wonder that Doctor Nathaniel True lost no opportunity to hand down to posterity what he knew about the early history of our town. He was a man with a great mind, most interesting as a writer. What a pleasure it must have been to have listened to his stories. 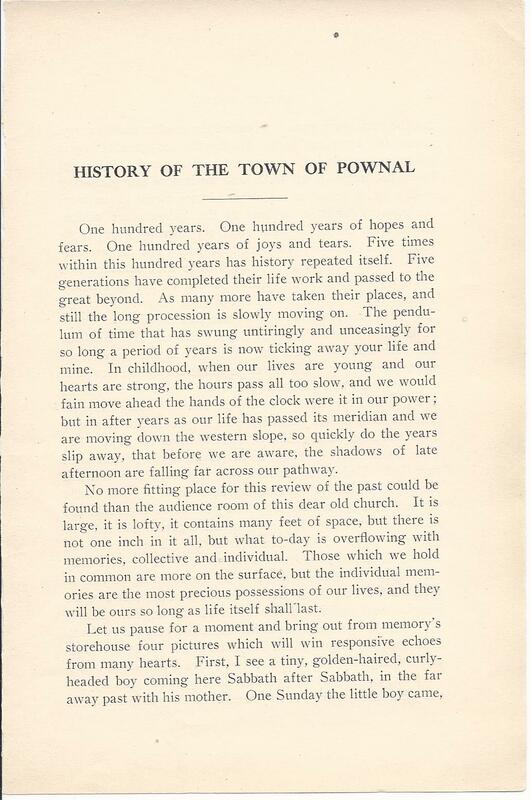 Very interestingly does he tell in a magazine article contributed to "Old Times", of Pownal's peculiar people. These characters lived in the early part of the last century. I will only mention their names, and some of you may recognize them. Dodge, the Beggar, whose wife was the daughter of Josiah Reed, and probably was the first white woman born in Pownal. Even though he begged from force of habit, a pot of gold and silver to the amount of $4000 was found in his old home after his death. Simeon Magus came to Pownal near the close of 1812. He was a hermit and died about 1832. Timothy Crocker was also a hermit. The other three were James McCormick, Richard Fitz, and John Johnson. 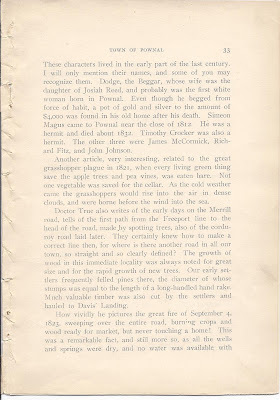 Another article, very interesting, related to the great grasshopper plague in 1821, when every living green thing save the apple trees and pea vines, was eaten bare. Not one vegetable was saved for the cellar. As the cold weather came the grasshoppers would rise into the air in dense clouds, and were borne before the wind into the sea. 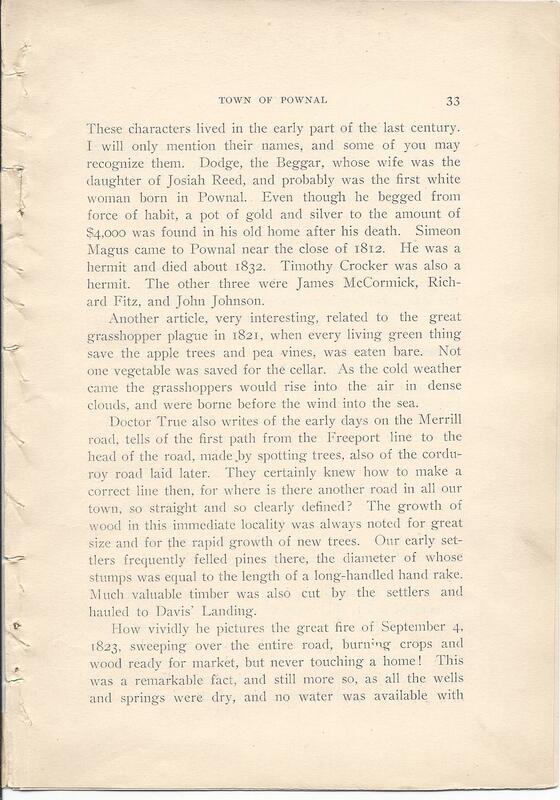 Doctor True also writes of the early days on the Merrill road, tells of the first path from the Freeport line to the head of the road, made by spotting trees, also of the corduroy road laid later. They certainly knew how to make a correct line then, for where is there another road in all all town, so straight and so clearly defined? 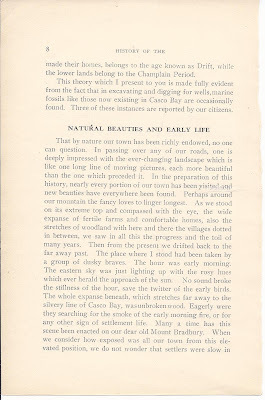 The growth of wood in this immediate locality was always noted for great size and for the rapid growth of new trees. Our early settlers frequently felled pines there, the diameter of whose stumps was equal to the length of a long-handled hand rake. Much valuable timber was also but by the settlers and hauled to Davis' Landing. which to fight the fire. 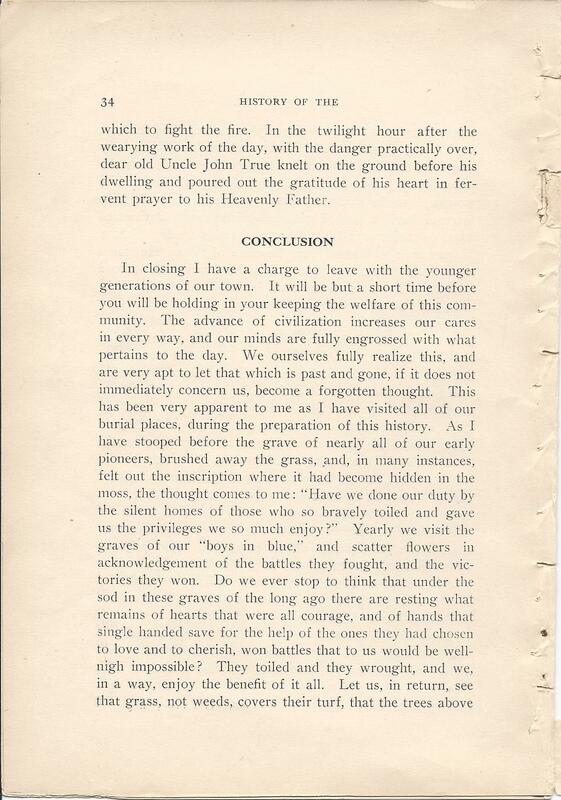 In the twilight hour after the wearying work of the day, with the danger practically over, dear old Uncle John True knelt on the ground before his dwelling and poured out the gratitude of his heart in fervent prayer to his Heavenly Father. them, through which the breezes blow and where the morning and evening birds carol their mating songs, are carefully trimmed. Be the marble white or gray, let us see that it is kept in place, and whenever opportunity offers, let us be unsparing of God's messengers of faith, hope and love, the flowers. Never must we forget their full and perfect trust in the Giver of all good and perfect things. When these lessons have been learned, when the spirit and faith of the early settlers of the last century has become our guiding star, we shall have secured for ourselves a heritage, and for our children an inheritance better than silver and gold. In the year of our Lord one thousand seven hundred and eighty-nine. 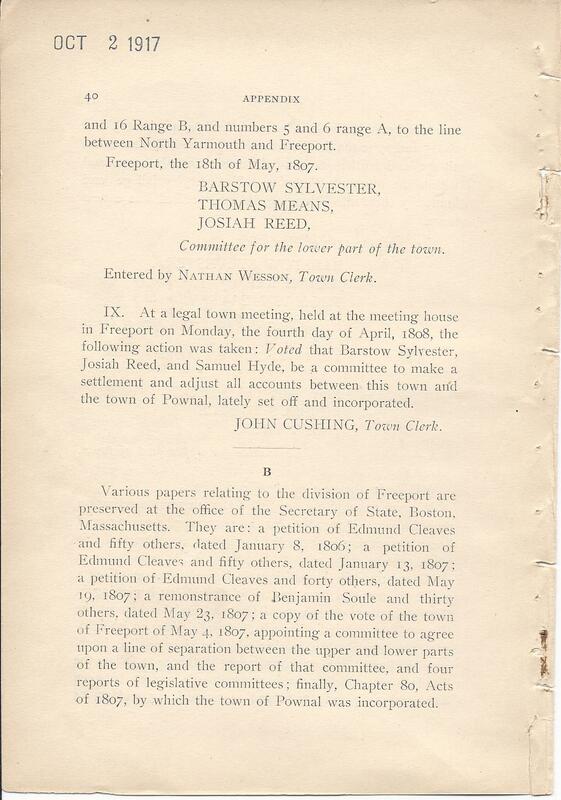 An act for incorporating the northeasterly part of the town of North Yarmouth, together with a tract of land called Prout's Gore in County of Cumberland, into a separate town by name of Freeport. II. 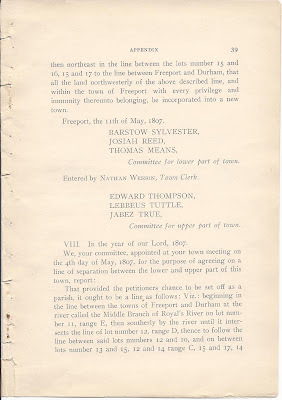 At a meeting of the freeholders and other inhabitants of the Town of Freeport, on Monday, 7th day of May, 1798. Voted, that Mr. Alfred Johnson preach four Sabbaths in the westerly part of this Town the ensuing year. III. 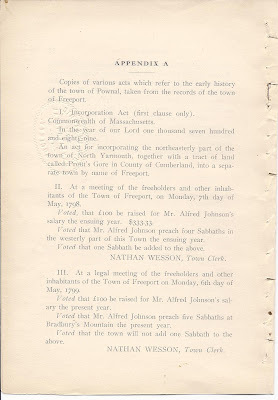 At a legal meeting of the freeholders and other inhabitants of the Town of Freeport on Monday, 6th day of May, 1799. Voted that Mr. Alfred Johnson preach five Sabbaths at Bradbury's Mountain the present year. Voted that the town will not add one Sabbath to the above. IV. 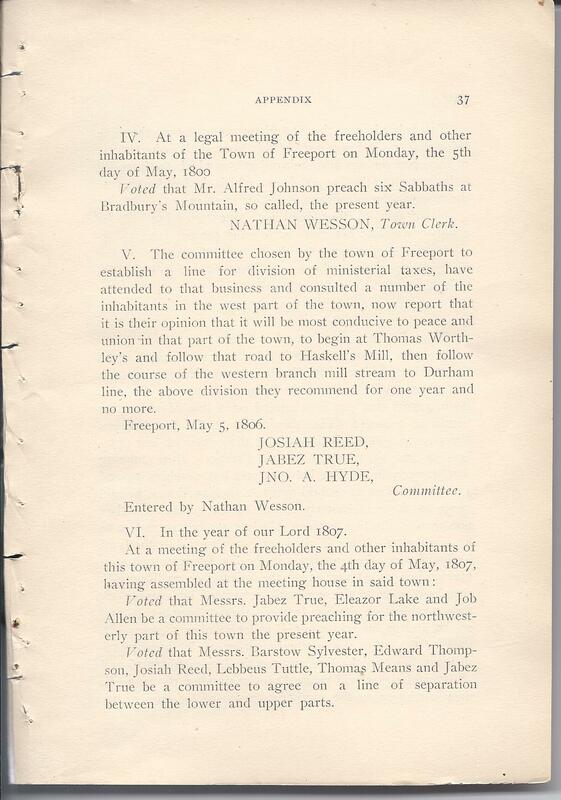 At a legal meeting of the freeholders and other inhabitants of the Town of Freeport on Monday, the 5th day of May, 1800. Voted that Mr. Alfred Johnson preach six Sabbaths at Bradbury's Mountain, so called, the present year. 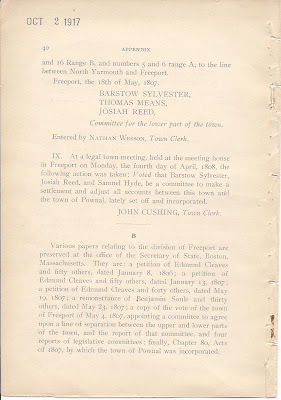 V. The committee chosen by the town of Freeport to establish a line for division of ministerial taxes, have attended to that business and consulted a number of the inhabitants in the west part of the town, now report that it is their opinion that it will be most condusive to peace and union in that part of the town, to begin at Thomas Worthley's and follow that road to Haskell's Mill, then follow the course of the western branch mill stream to Durham line, the above division they recommend for one year and no more. Voted that Messers. Jabez True, Eleazor Lake and Job Allen be a committee to provide preaching for the northwesterly part of this town the present year. Voted that Messrs. Barstow Sylvester, Edward Thompson, Josiah Reed, Lebbeus Tuttle, Thomas Means and Jabez True be a committee to agree on a line of separation between the lower and upper parts. 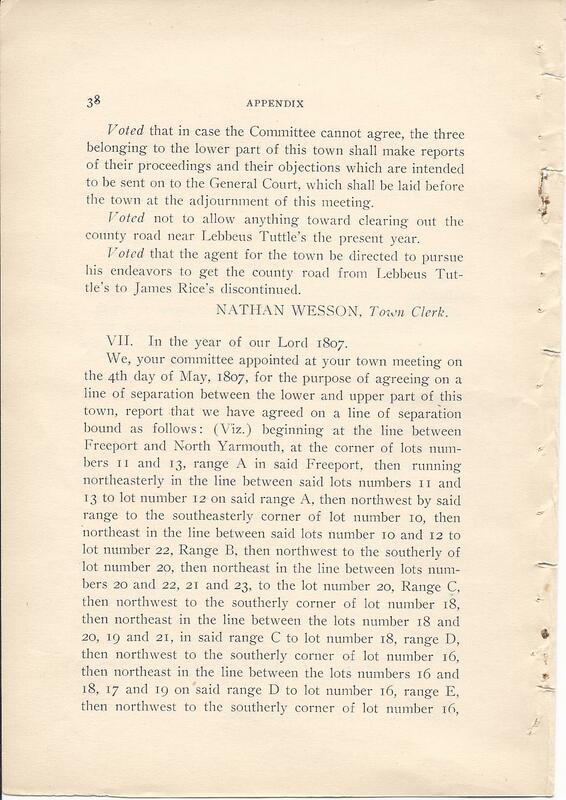 Voted that in case the Committee cannot agree, the three belonging to the lower part of this town shall make reports of their proceedings and their objections which are intended to be sent on to the General Court, which shall be laid before the town at the adjournment of this meeting. Voted not to allow anything toward clearing out the county road near Lebbeus Tuttle's the present year. 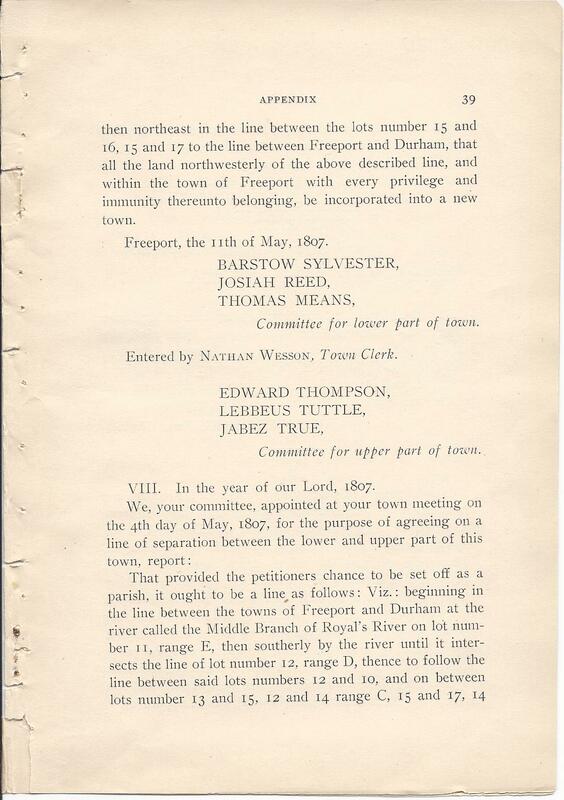 then northeast in the line between lots number 15 and 16, 15 and 17 to the line between Freeport and Durham, that all the land northwesterly of the above described line, and within the town of Freeport with every privilege and immunity thereunto belonging, be incorporated into a new town. and 16 Range B, and numbers 5 and 6 range A, to the line between North Yarmouth and Freeport. Freeport, the 18th of May, 1807. IX. 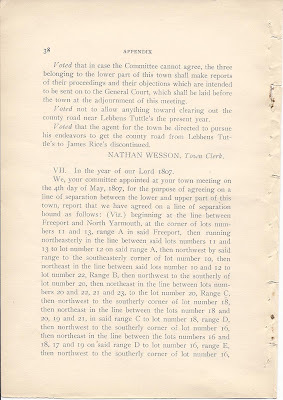 At a legal town meeting, held at the meeting house in Freeport on Monday, the fourth day of April, 1808, the following action was taken: Voted that Barstow Sylvester, Josiah Reed, and Samuel Hyde, be a committee to make a settlement and adjust all accounts between this town and the town of Pownal, lately set off and incorporated. 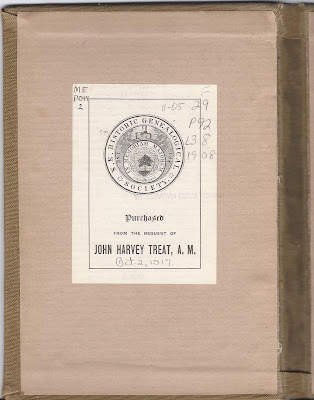 Various papers relating to the division of Freeport are preserved at the office of the Secretary of State, Boston, Massachusetts. They are: a petition of Edmund Cleaves and fifty others, dated January 8, 1806; a petition of Edmund Cleave and fifty others, dated January 13, 1807; a petition of Edmund Cleaves and forty others, dated May 19, 1807; a remonstrance of Benjamin Soule and thirty others, dated May 23, 1807; a copy of the vote of the town of Freeport of May 4, 1807; appointing a committee to agree upon a line of separation between the upper and lower parts of the town, and the report of that committee, and four reports of legislative committees; finally, Chapter 80, Acts of 1807, by which the town of Pownal was incorporated. very interesting as my gr grand mother, Helen Maria Loring. b.1850 Topsfield,Me. 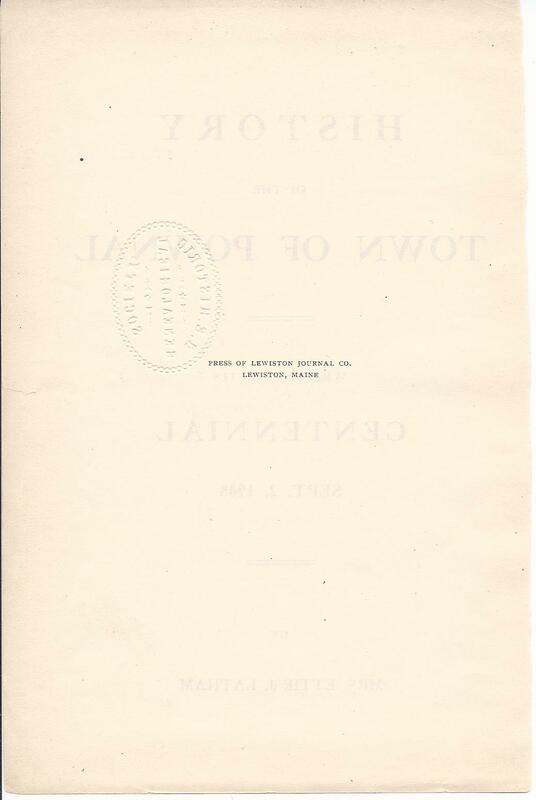 d,1920 Lisbon falls, Me. Married G.W. Keirstead in 1872 and they resided in Pownal for several years before moving to fryeburg, where Gershom W Keirstead opened his blacksmith shop. Interesting comment! 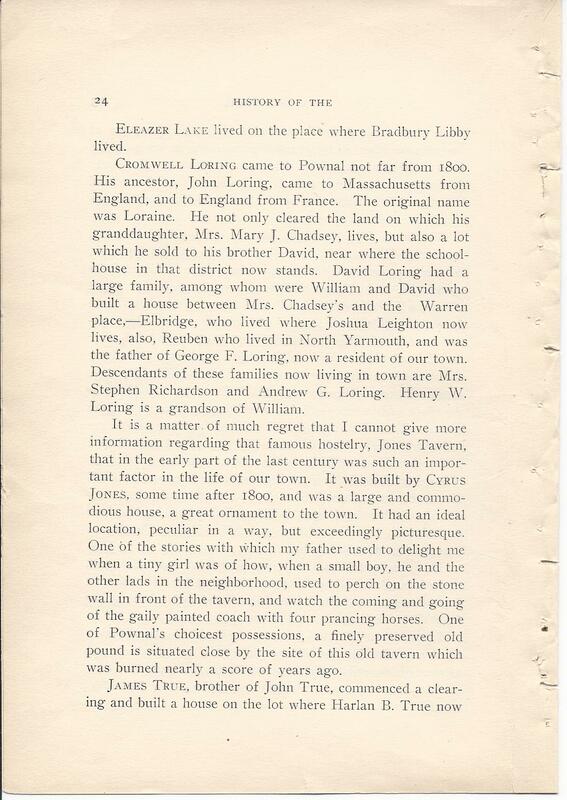 I wonder if your great grandmother came from the same Loring family that earlier settled in Pownal. Lots of Lorings and Keirsteads in Washington County, Maine.